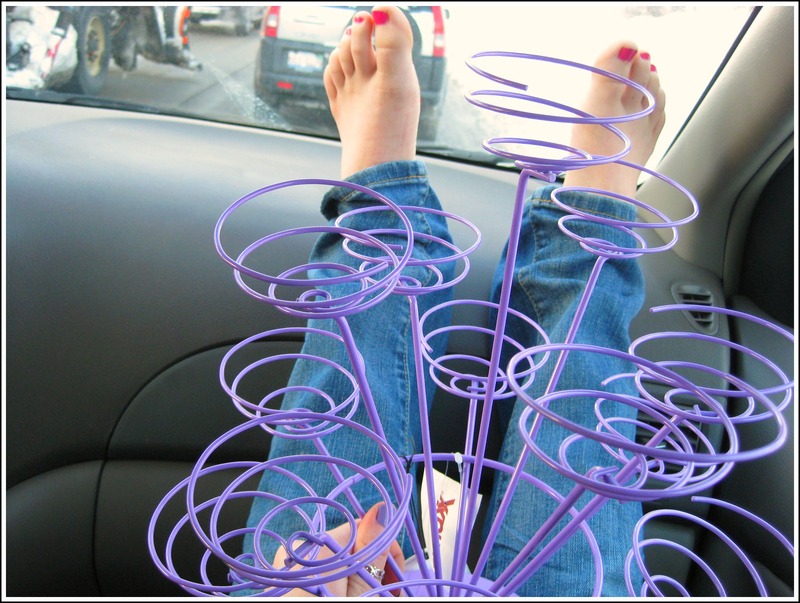 Heals (winner by a landslide): I’m three times taller and six times more unpleasant. Some people just can’t multi-task. My friend can’t talk while she’s driving. London can’t chew gum while walking. And I can’t be pleasant while in heals. Panna Cotta: I’m an expert at short-lived inspiration. 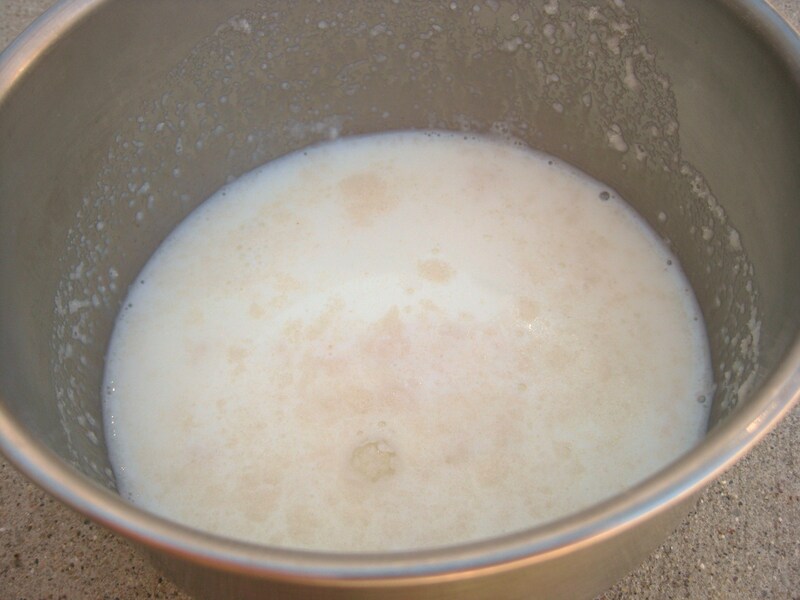 A few months ago I tried to make panna cotta, only it stayed liquid. 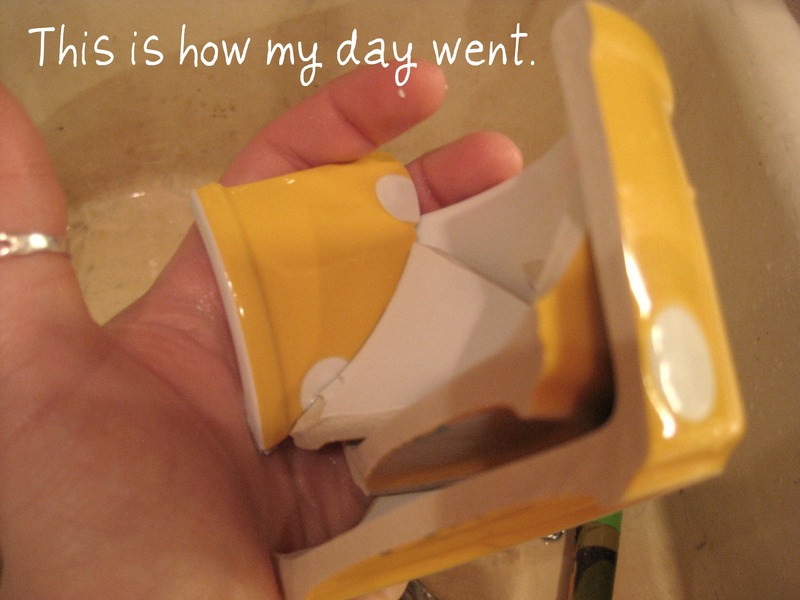 I didn’t even take a picture. 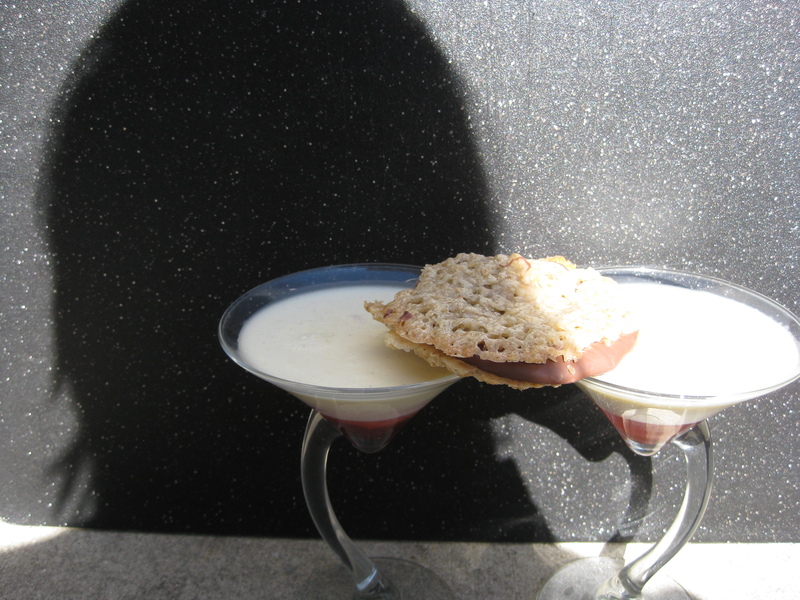 Which is why I was a not-too-happy-camper when I found out my first Daring Bakers Challenge would be Panna Cotta. 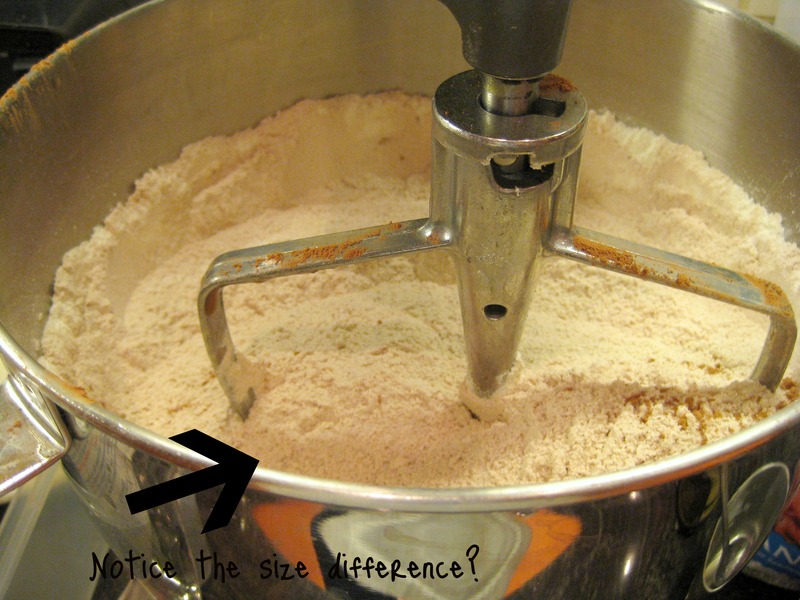 Put a medium-sized bowl in the fridge for a few minutes before you start. 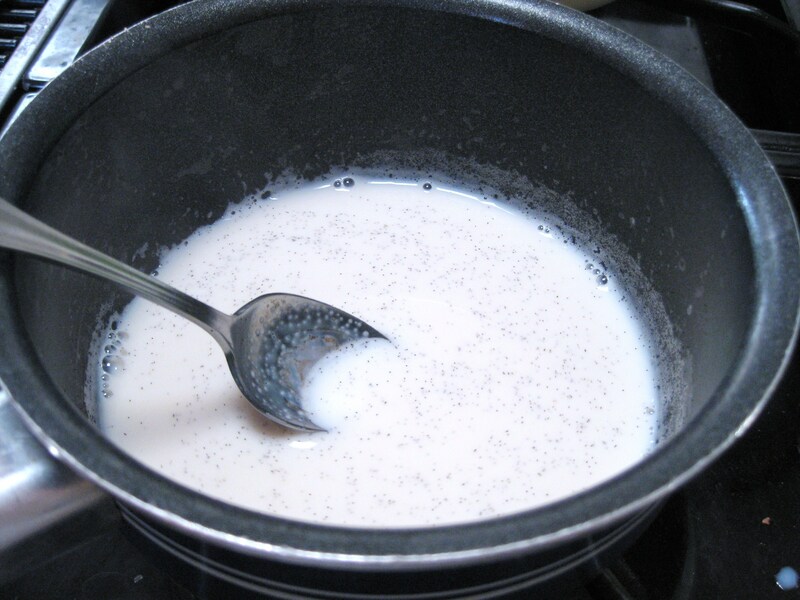 Take the bowl out of the fridge and add milk into a bowl sprinkle the gelatin over it in a thin layer. 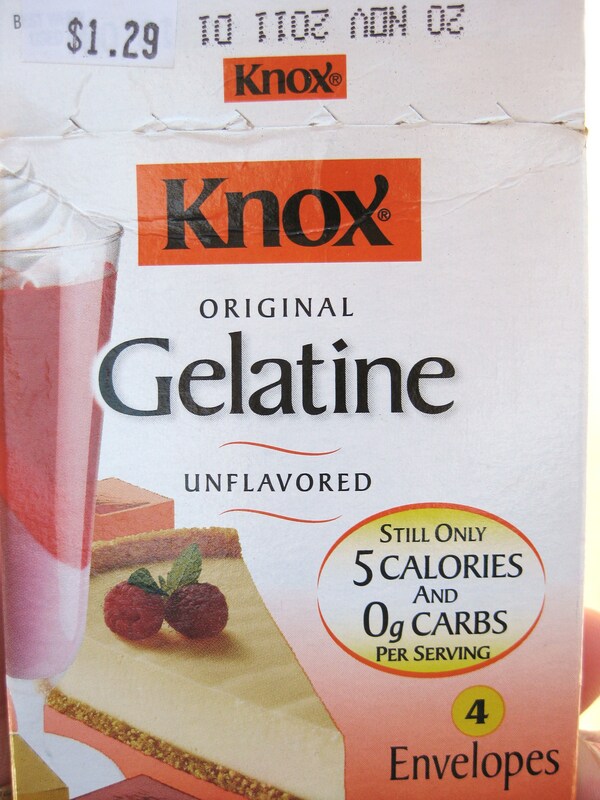 Let the milk and gelatine stand for 5 minutes. Next, add the remaining ingredients and continue to occasionally stir over heat. 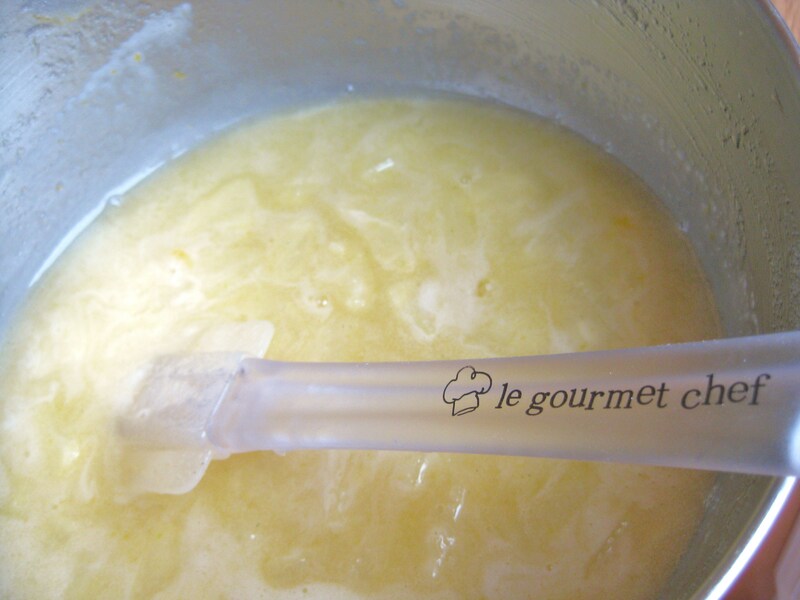 Allow to cool while making your Fruit Gelee. 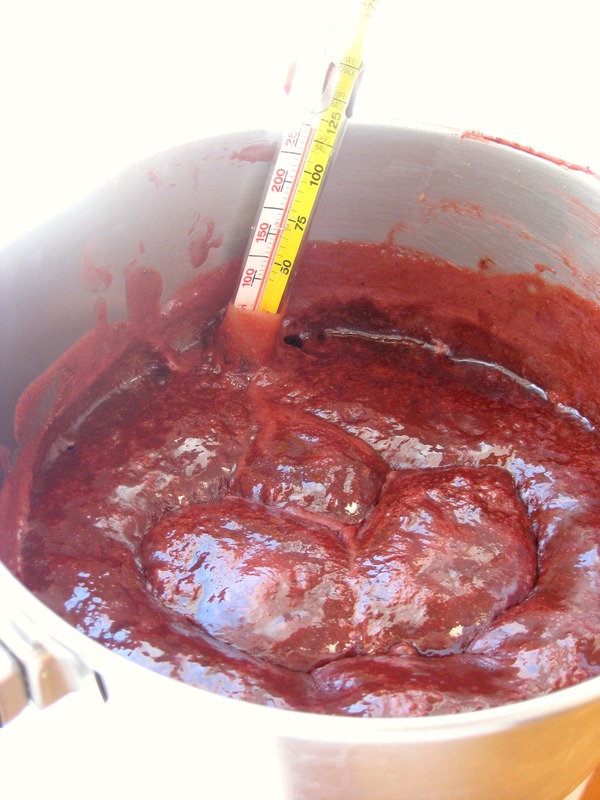 Place fruit and sugar in a small saucepan and allow it to simmer, stir until sugar is dissolved. 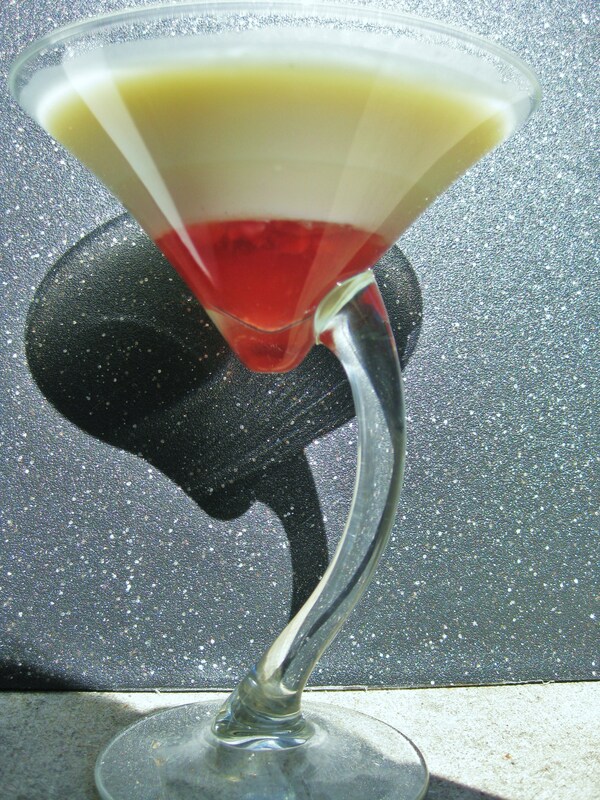 Allow to cool, then add to the bottom of the glasses you plan to use for the panna cotta. Allow to sit a few minutes before adding the Panna Cotta. 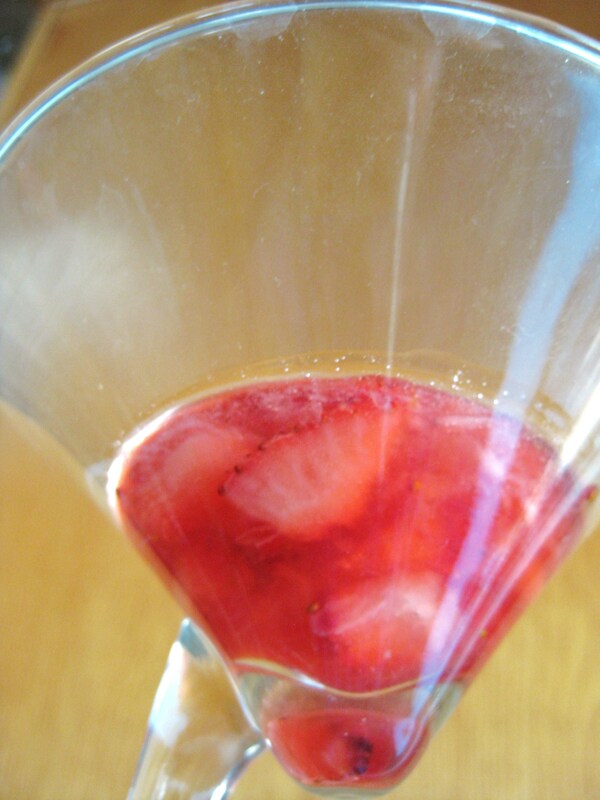 Once both the fruit gelee and panna cotta have been added to the glass, refrigerate 6 hours or overnight. 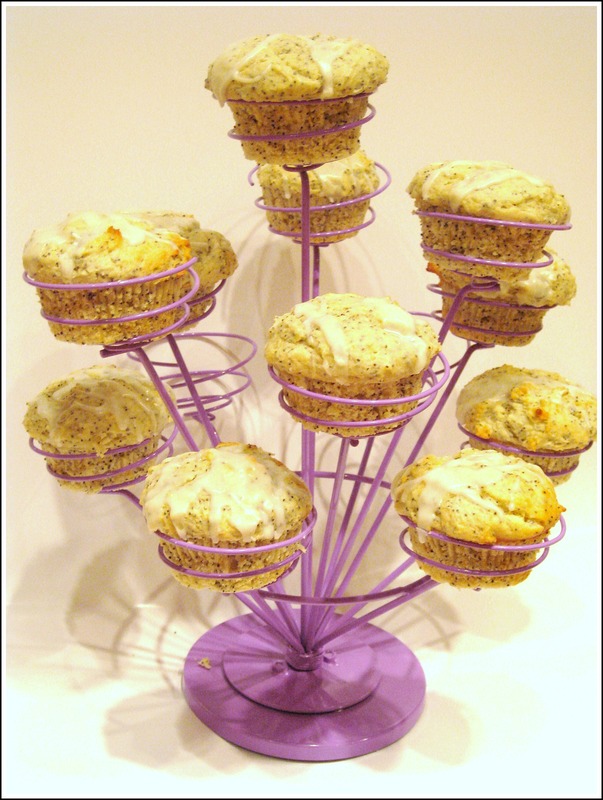 Next thing we needed to make was Nestle Florentine Cookies. 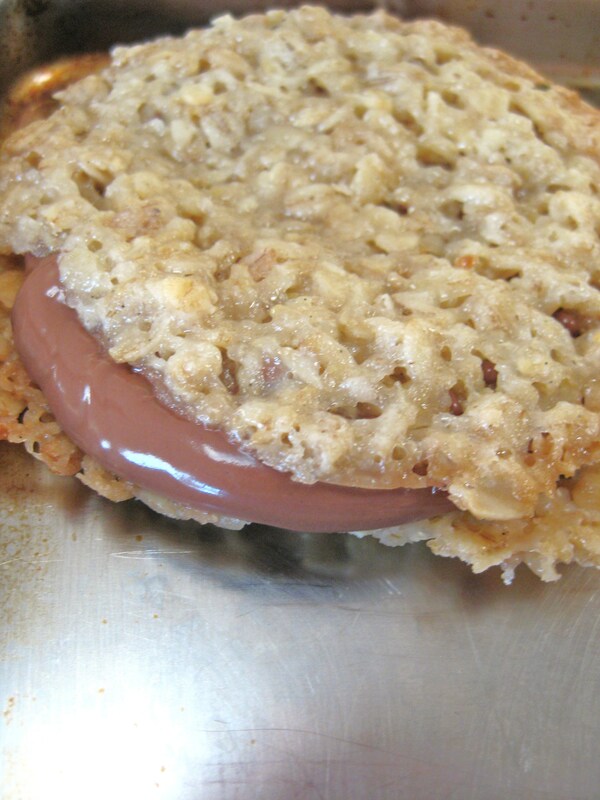 It was cool to try these, but they I won’t make them again. They definitely weren’t my family’s favorite. 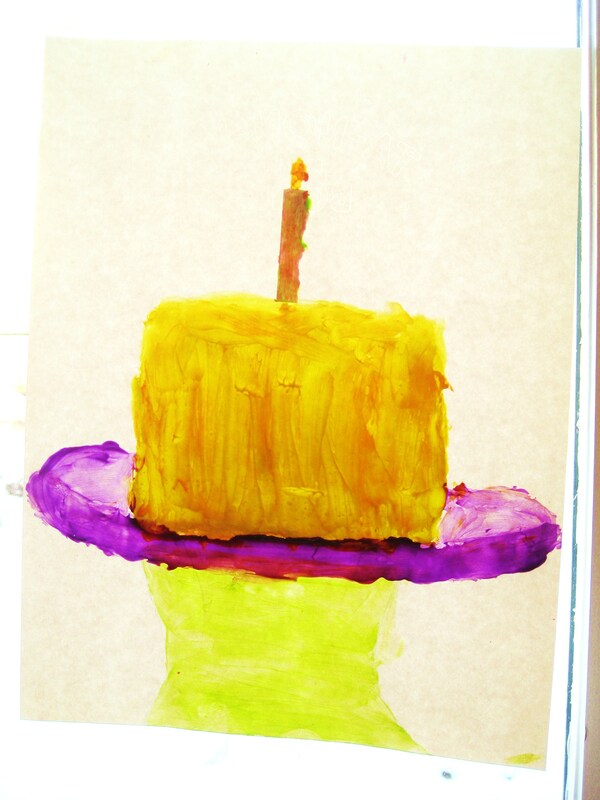 Overall my first Daring Baker’s challenge was a success!! I’ve conquered Panna Cotta and it’s no longer on my Death Traps list- the last thing keeping the list from going out of exsistance, heals. Frittata. Frit-Ta-Ta. Don’t you kind of want to sing it? Even a little? This past week my friend Mag was in a play. A play where she got to miss school. For two days. Let me tell you: make-up work stinks. There’s a lot. It’s stressful. And sometimes you just want to give up on it. Today Mag and I did one of her make-ups. The Frit-Ta-Ta make-up. You’ve got to love cooking. Because in cooking you’re make-up is a Frit-Ta-Ta. 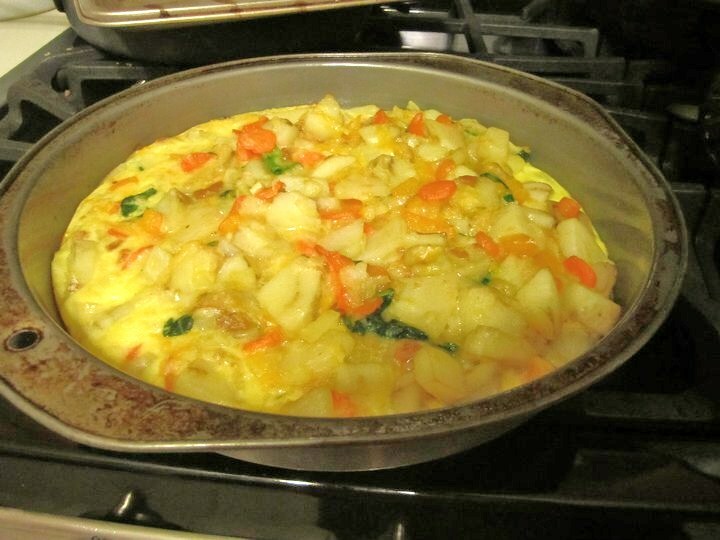 And this is what a Frittata is…. Whole wheat bread cubes or the bread of 1 whole wheat hamburger bun, torn up. 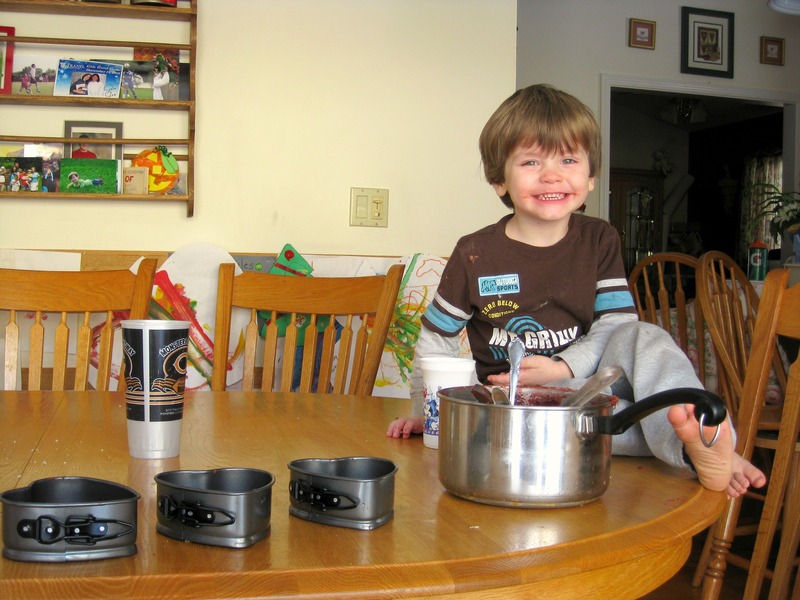 Boil water and cook the potatoes. 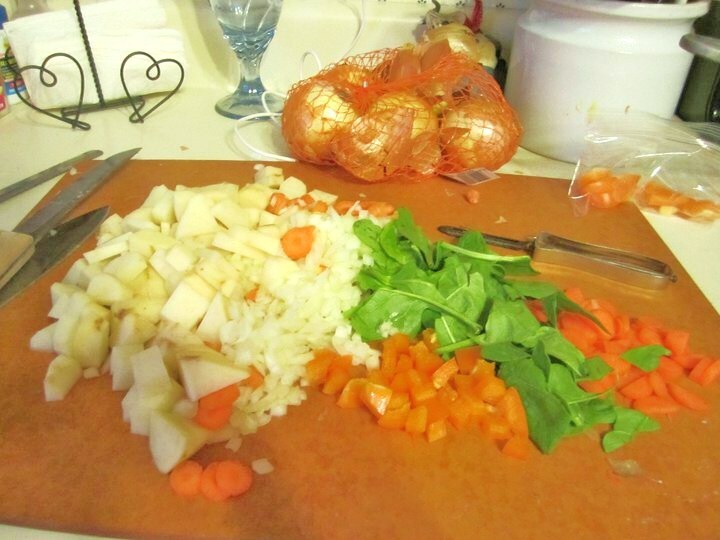 Put the olive oil and veggies that will need to cook longer into the pan (Carrots and onions) When the carrots are softer, add the rest of the veggies. 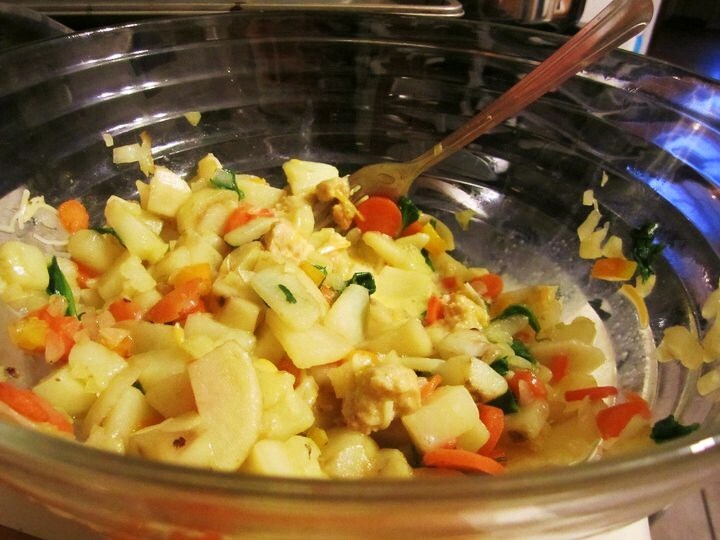 Combine the eggs, half-and-half, cooked veggies, salt and pepper, and the cheese. Now, put it in a pan (whatever will work, but a pie tin was the perfect size for us) and pop it in the oven for 20-25 minutes. 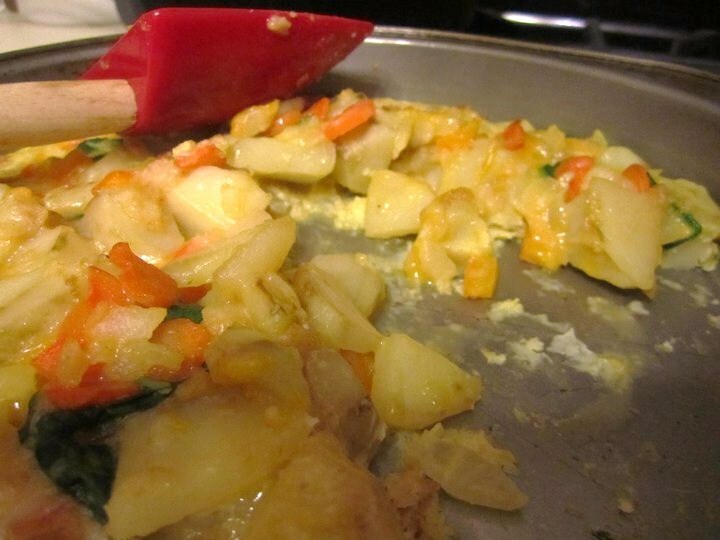 Since you already cooked the veggies, all you need to cook is the eggs. So when they’re cooked, it’s done! If all make-ups were like this I’d never go to school. Ever. 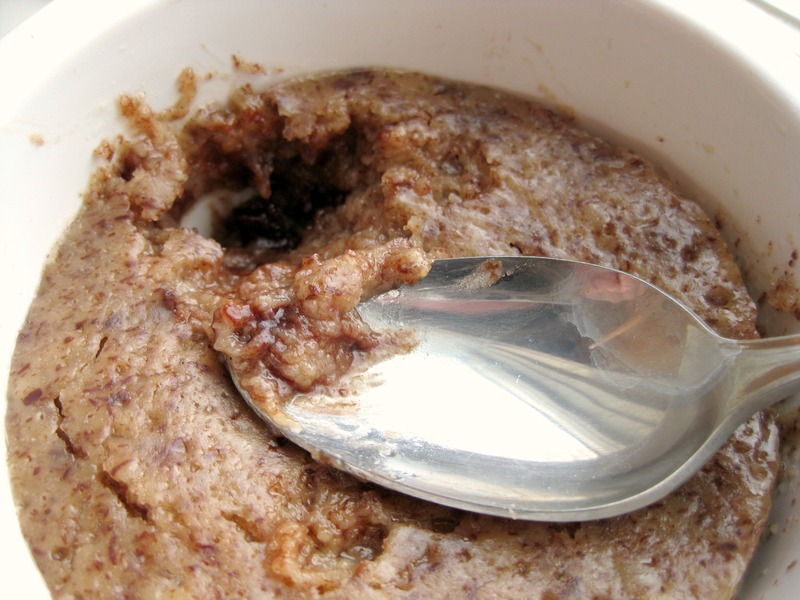 This seems like a breakfast, but it’s great for dinner, too! Have fun with the recipe, you can really throw in anything you want. Veggies, different kinds of cheese, it’s not tempermental! So go make one!! Throw in whatever you want, because there’s no possible way to mess this oen up! Time to hit the hay, have a Frit-Ta-Ta filled Friday!! 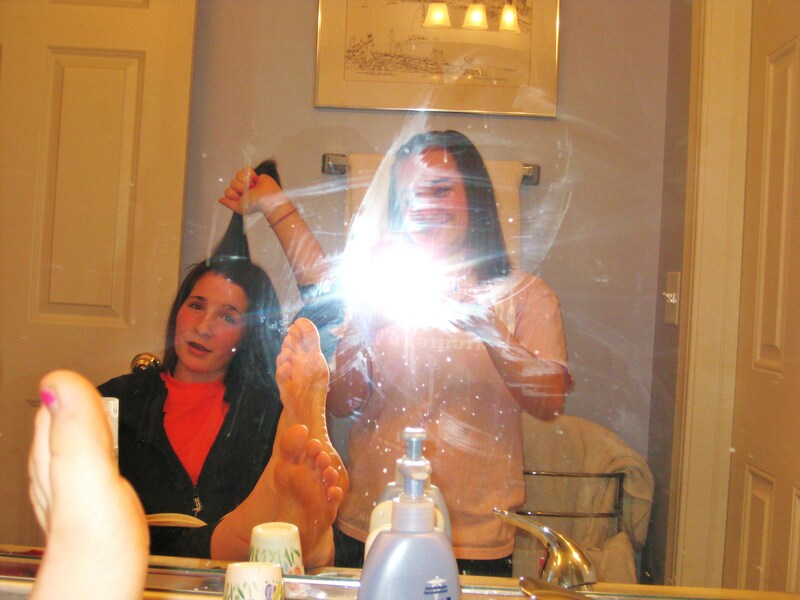 Lizzie and my realization of the week: The people of this generation who religiously straighten their hair (that’d be us) are going to be bald before they even see a nursing homes. In other news, today I made cupcakes! 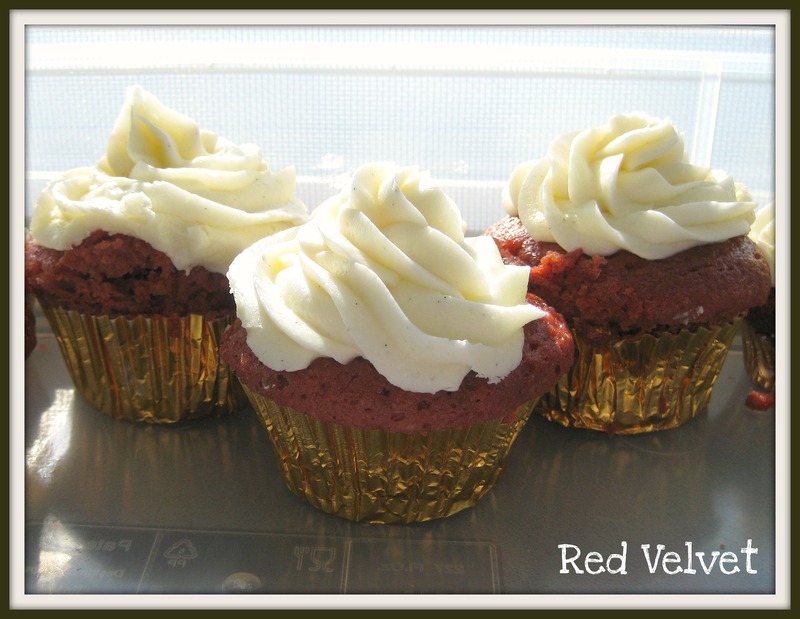 I’m trying out different cupcake recipes. Since I got the dates for the Gale Gand event I was going to help out with wrong, I’m making an I’m-sorry-please-forgive-me-and-accept-this-cupcake-because-sweets-make-everything-better cupcake. 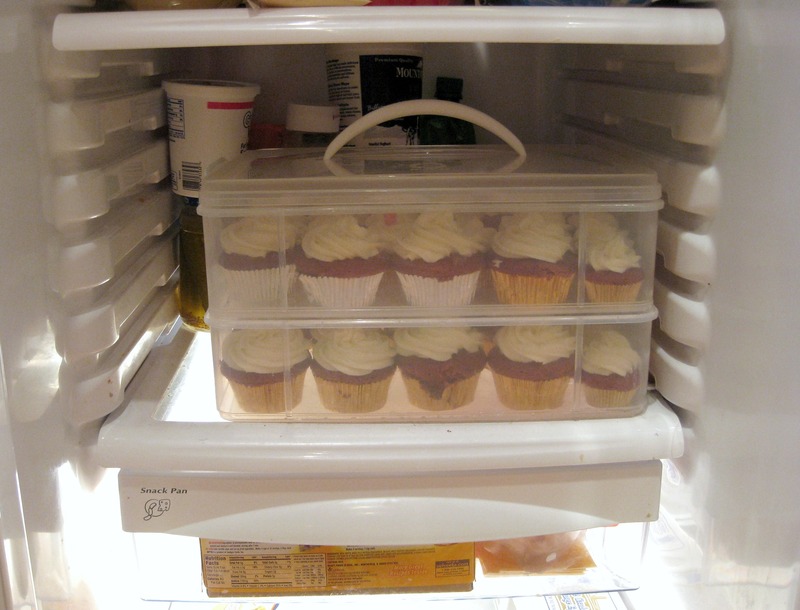 This was kind of a test-run, but who doesn’t like having a few extra cupcakes lying around in their house? 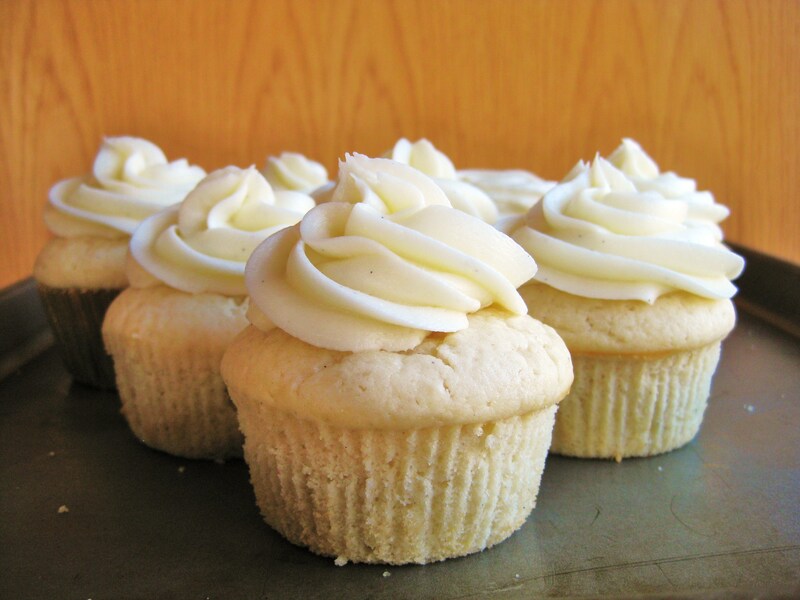 I tried out a new cream cheese frosting recipe and didn’t like it at all, so I’m not going to include the recipe. 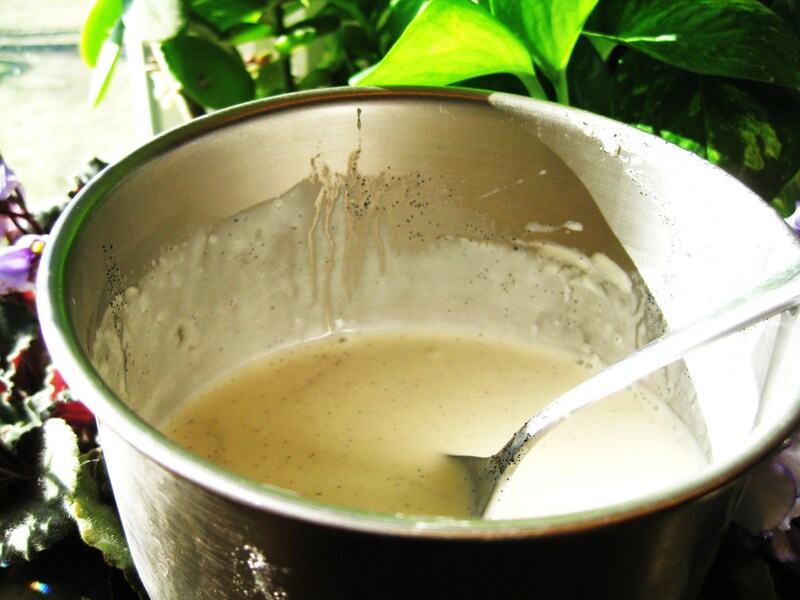 Combine the milk and vanilla bean paste over medium heat, remove from heat before it begins to simmer, allow to cool. 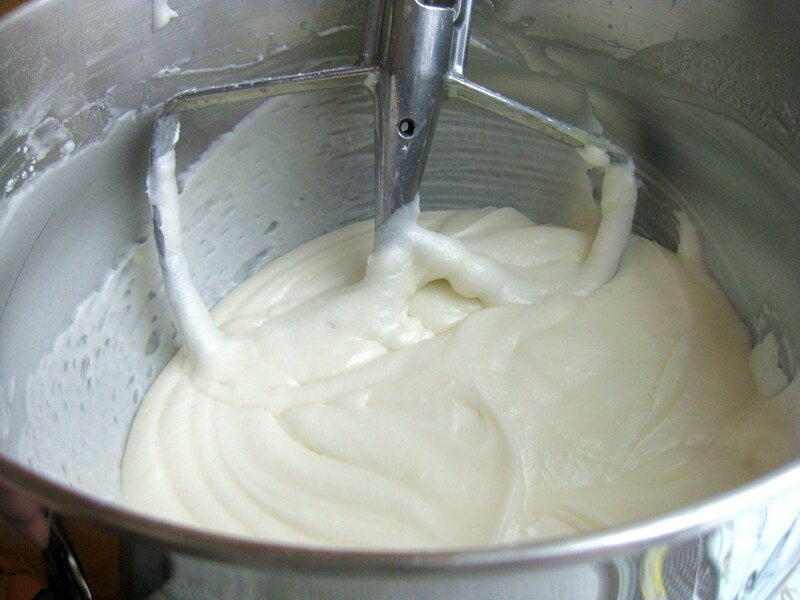 Combine the milk mixture with the sour cream, greek-style yogurt, and vanilla extract. 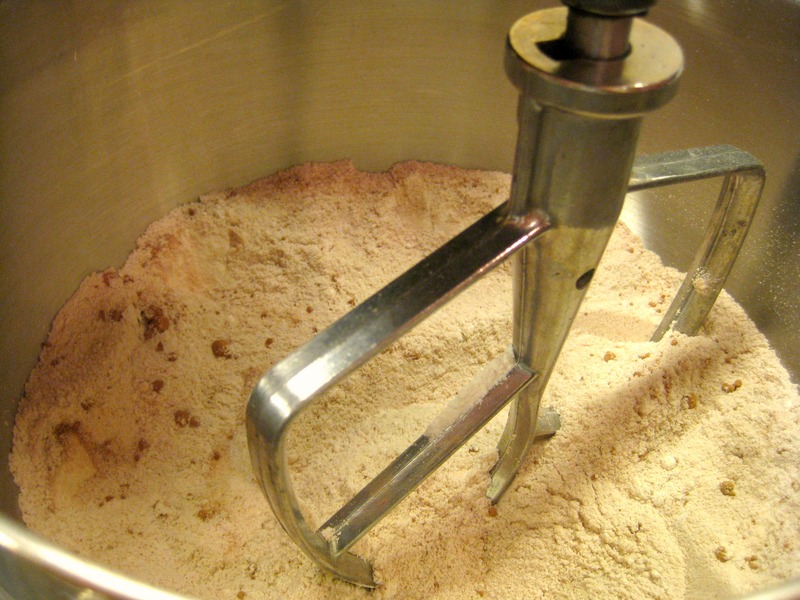 Combine the dry ingredients and the wet VERY SLOWLY AND JUST UNTIL COMBINED, if you whip them they will loose the fluffy texture that makes them so good! 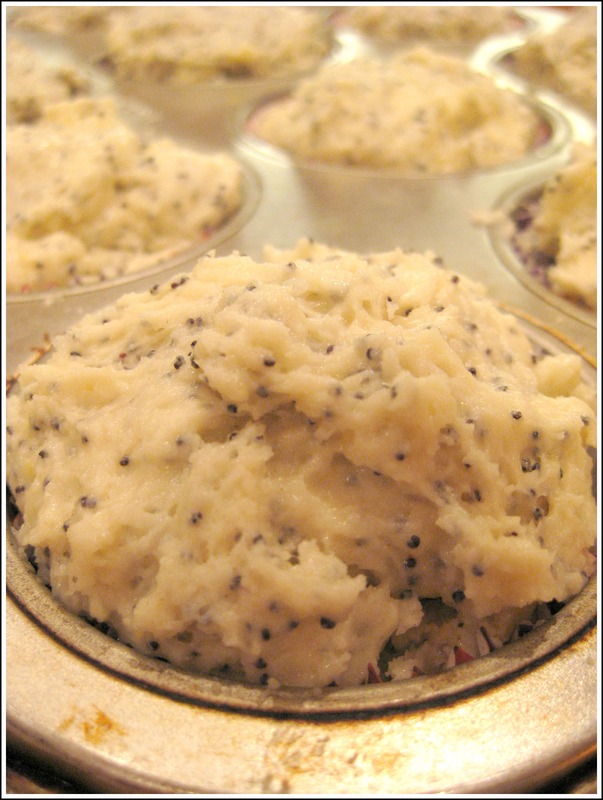 Use an ice-cream scooper to transfer into muffin tines. Bake about 23 minutes. 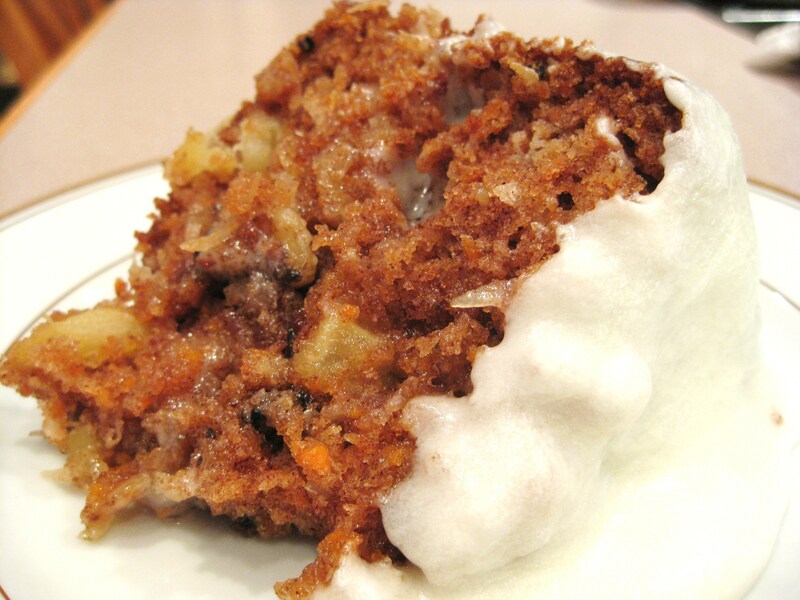 It’s best to bake LESS than more. 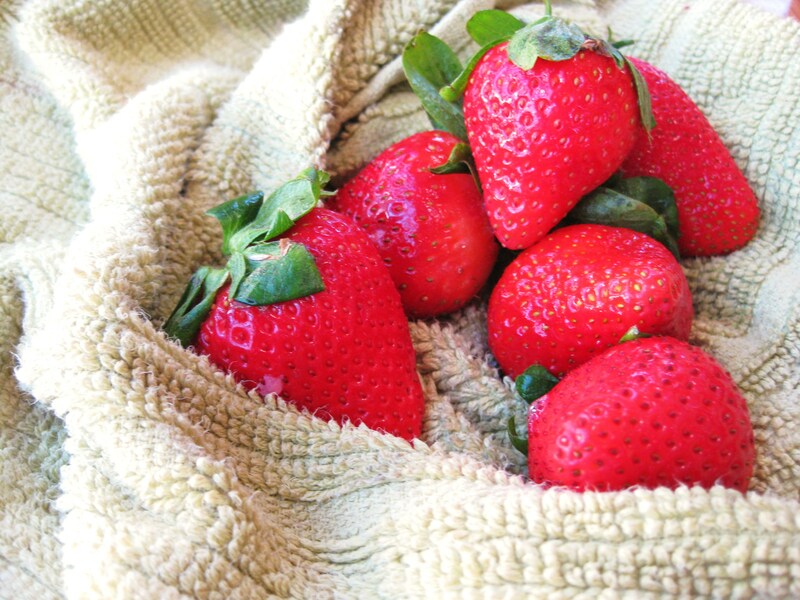 When you take them out of the pan, they might feel too soft. They’re not. Trust me. Yes. That’s a smooshy cake, smooshed with any hope of making money off of food-art. That painting alone took me thirty minutes to paint and about as long to photoshop. Sad? Trust me, I know. At least Nicky enjoyed it. 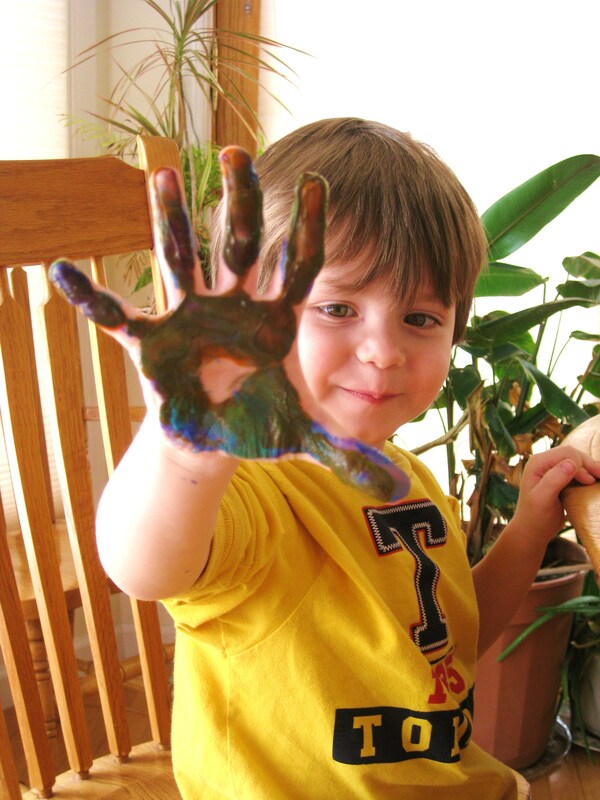 The handprints were his favorite. Such concentration! When Nick went to bed I stopped painting. 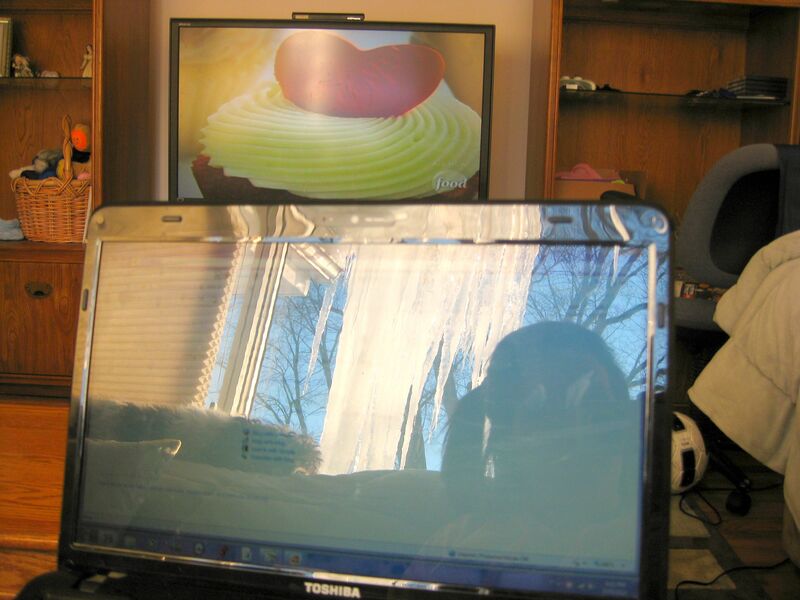 I just didn’t have the attention-span to fill all three windows. It was probably best, I don’t know how much longer my brother’s abs could have taken laughing. Apparently my pictures were so beautiful, they brought tears of happiness to his eyes. Can you blame him? 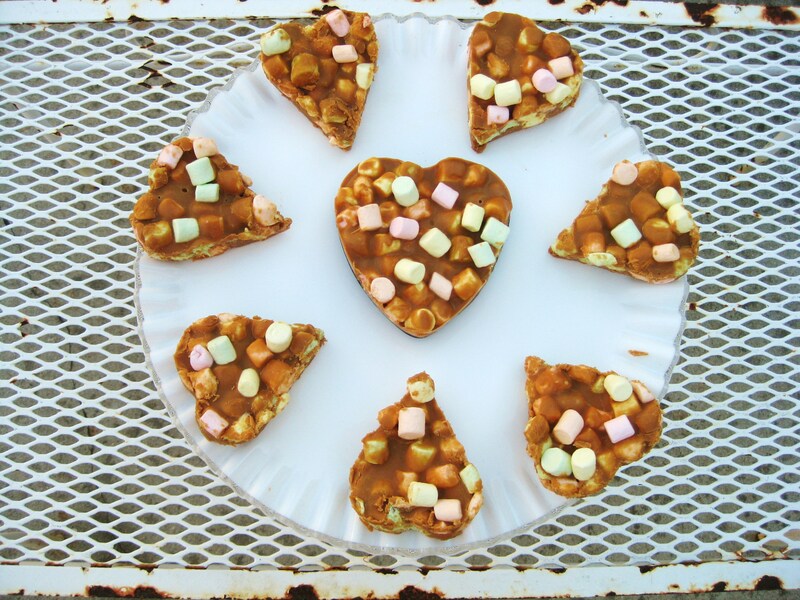 I made Butterscotch Peanut Butter Marshmellow Hearts. I still have no idea if I liked them or not… They combined two of my all-time favorite things, but I still don’t know. They were a little sweet even for me the sugar-addict. Huh. 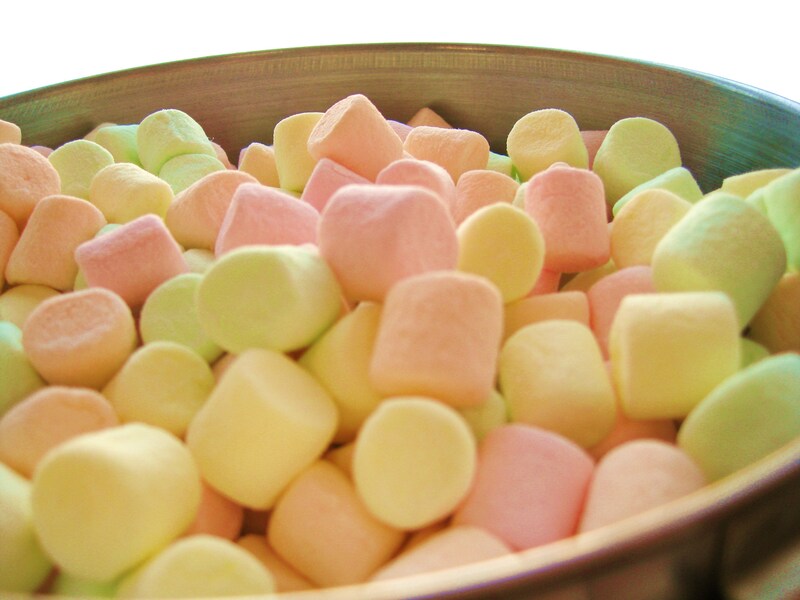 The different flavors of marshmallows wern’t my favorite things ever either, but they are definately adorable! 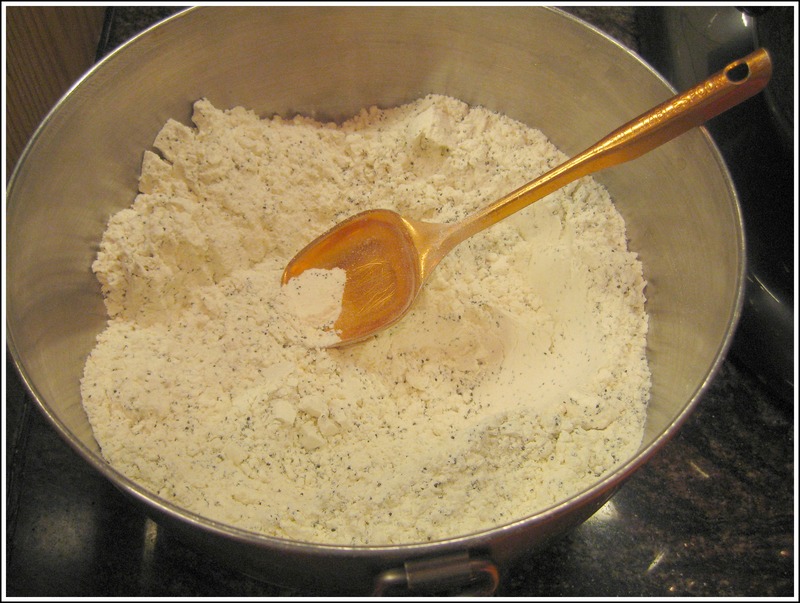 Line a medium-sized pan with parchament paper so that the paper reaches above the edges. Don’t use a pan that will make these too thick. 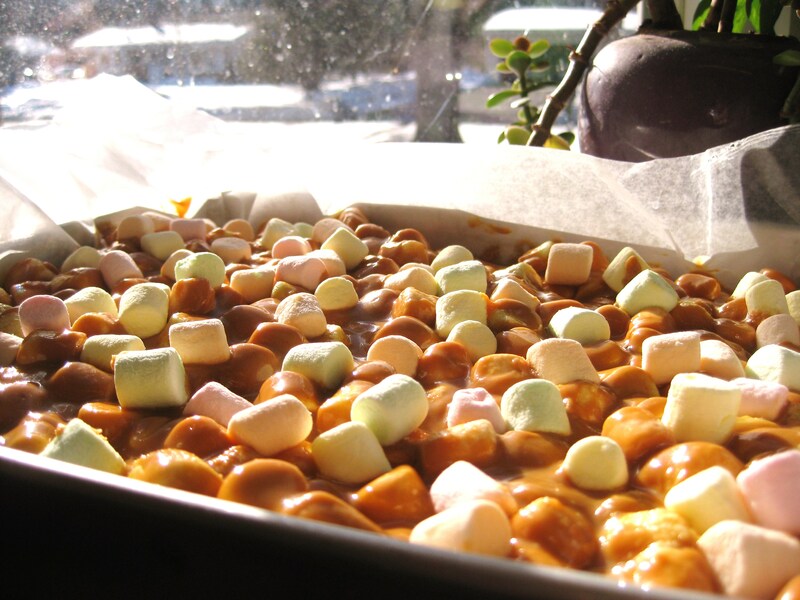 In a bowl above simmering water, melt together all ingredients except the marshmellows until there are no longer bumps. Once melted, take off heat and add the marshmellows. 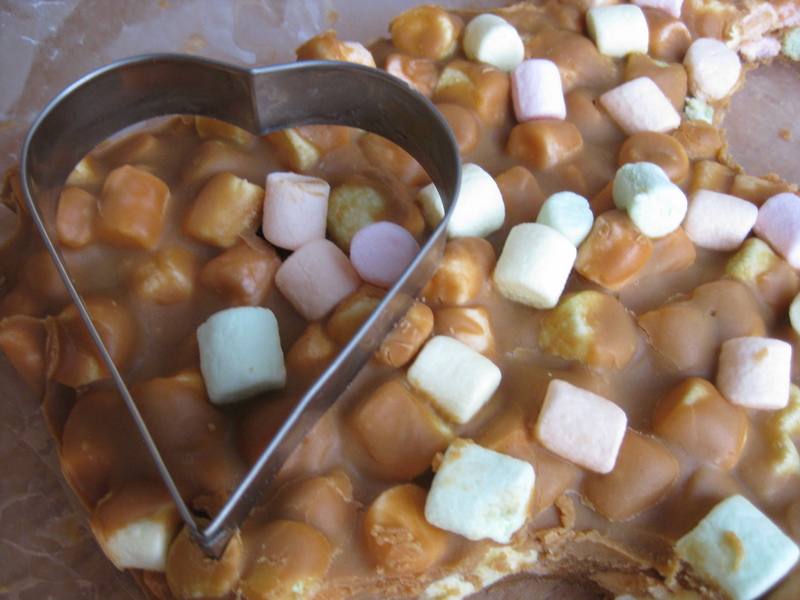 If you want, reserve some marshmellows to stick on the top for garnish. Pour into pan. Refridgerate until hard. 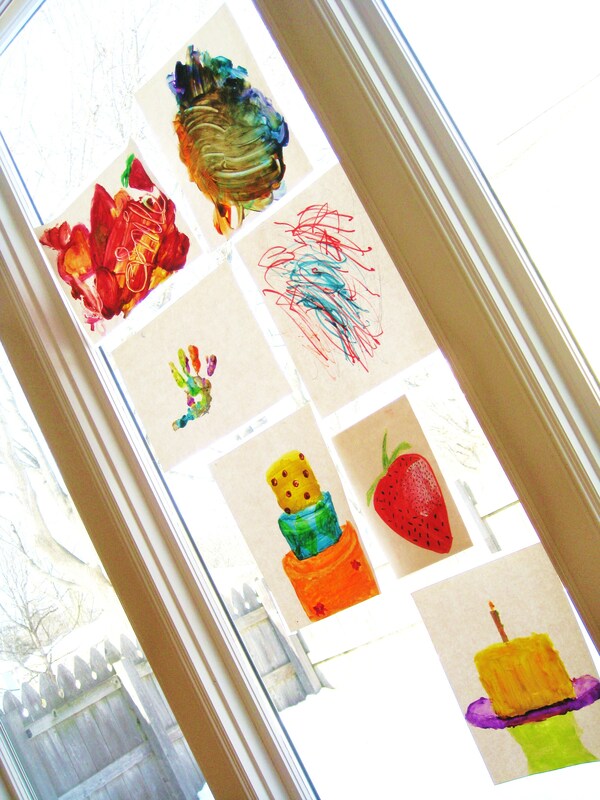 If desired, use a cookie cutter to make these into shapes. I used a heart! On that super sweet note, Happy-Tomorrow-Valentines day! Refer to the picture below to see how I feel about this past Friday. So.. know how I told you guys about the Gale Gand event I got to help out with? Well, I e-mailed her Thursday night and said: Can’t wait, see you tomorrow! She didn’t get the e-mail right away. It would figure since she was at the event that night. I messed up the dates. I swear I was going to cry. She was really nice about it and said she’ll find another event that I can help out with; which is amazingly kind of her since I totally messed up the dates. Bah! It’s Saturday and I’m still disappointed. Friends + Chocolate = Happiness. This simple equation, an equation I really couldn’t have messed up since there were no numbers, led to Claire, Nick, and I hanging in my kitchen Friday night. 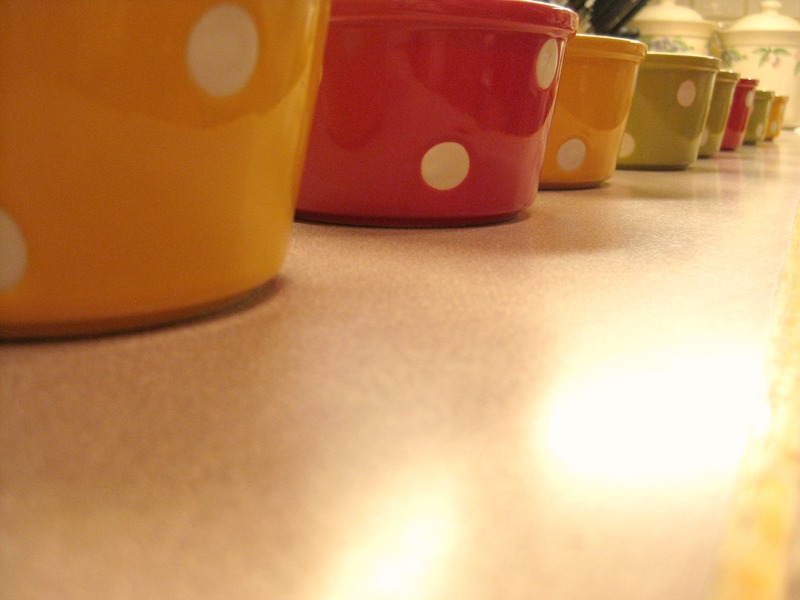 Here is where we concluded: chocolate heaven comes in a polka-dotted bowls. 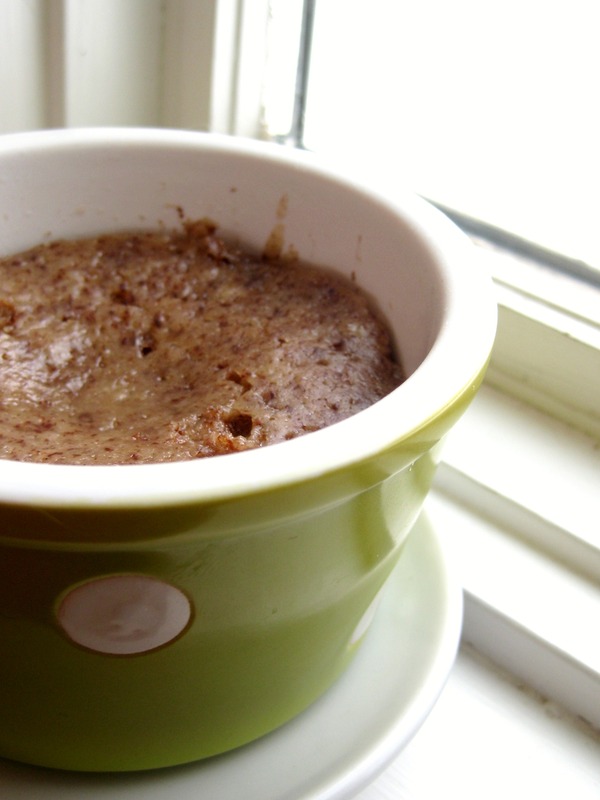 Steamed Chocolate Pudding Cake from Butter Sugar Flour Eggs is pretty much mind-blowing. 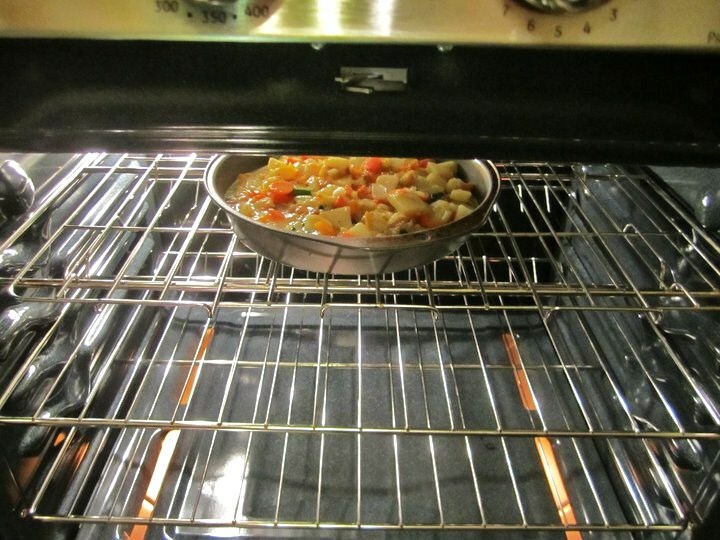 Which is why, right when it popped out of the oven, we each treated ourselves to our own bowl. My mom later pointed out the bowl sizes definately did not hold only one serving. Silly mother! Comfort food isn’t supposed to be a single serving! But it all worked out. Claire and I made a rough running schedule and today was our first morning. Which was a fabulous idea in itself since I SO was not running through the snow alone at 9am. 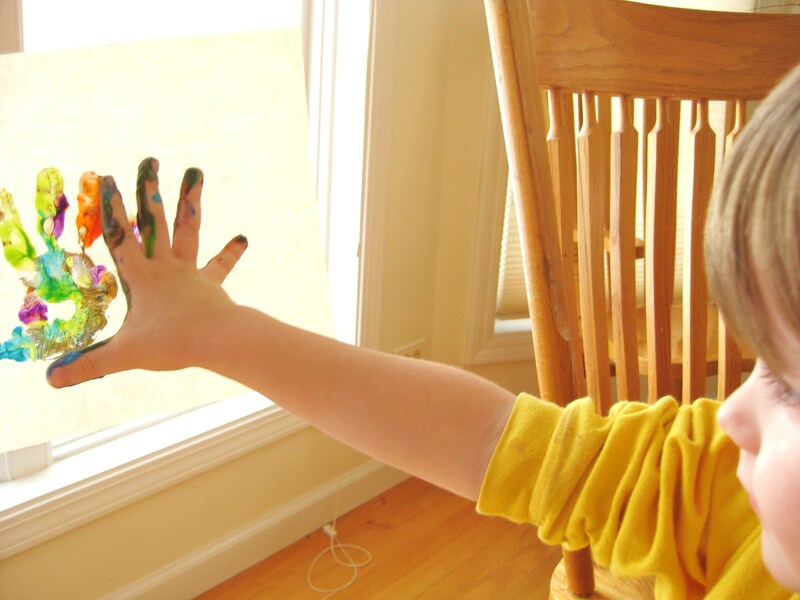 Later, Claire had homework. Ew. 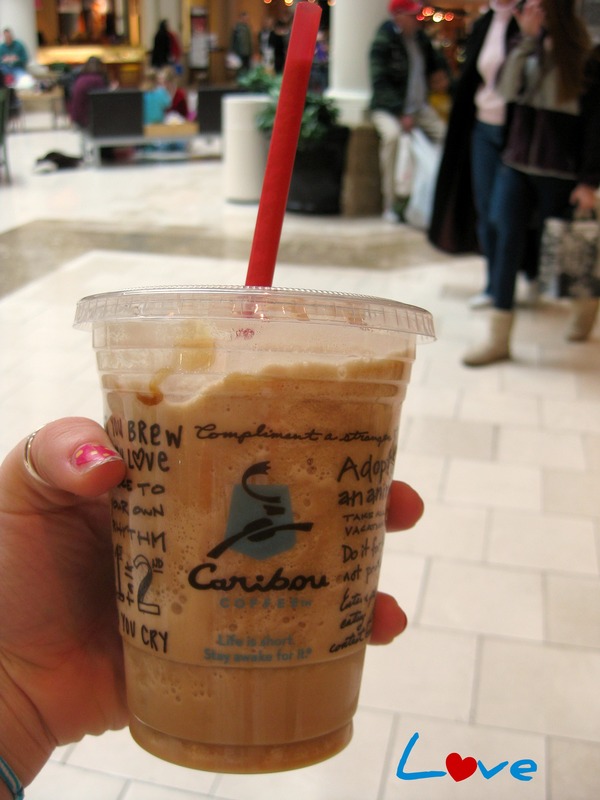 And I had Caribou (yum) at the mall with Liz. Caramel Coolers are the bomb. The point is, friends are amazing. Chocolate Pudding Cake is just about as great. And on my last note, It’s not just me and my jogging clothes. Fashion is on a downward spiral. 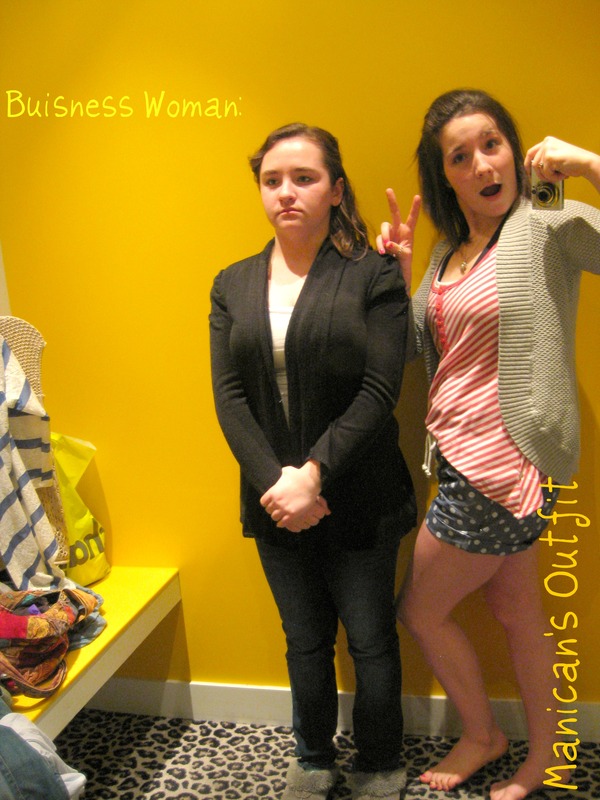 The exact outfit I’m wearing is what a manican was dressed in. I guess it takes a much more sophisticated mind to understand fashion…. Poor manican. Today was a fabulous day. It all started with this baby right here. Oh yes. 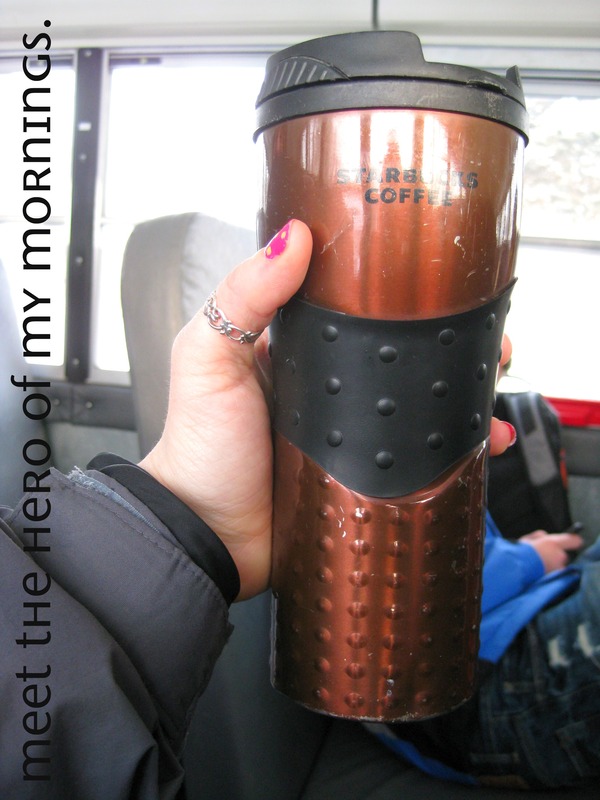 Highly caffeinated black tea on the bus? I think so. If you ever plan on transporting approximately a gazillion cupcakes via bus, I highly recommend having an entire cup of black tea beforehand. I’d rate my reflexes a solid A. We only went over a few minor bumps but I swear I would have gladly taken a trip to the chiropractor before I’d drop these on the bus floor. Seriously. Dropping them would have been altogether devastating and altogether more than my heart could handle. I’m no doctor but I’m pretty sure backs are easier to fix than hearts. 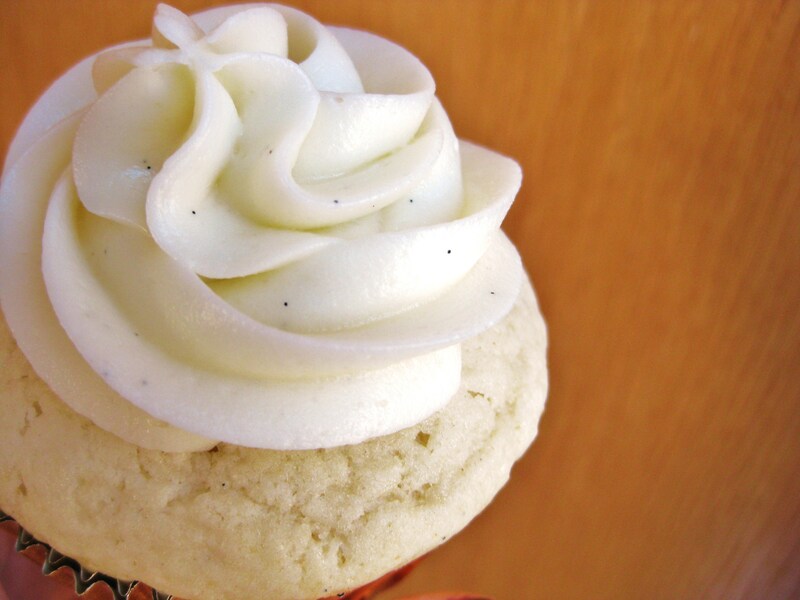 Making the cupcakes: These are actually really easy. Seriously. They couldn’t have been much easier. How, then, could I have forgotten the one thing basically everything has in it? Eggs. Uhm. Duh. Well that’s alright. I was in half panic mode that I’d be done at 6:30pm anyway. I don’t do too well with free time and a broken treadmill. Which is why I whipped up another batch. Only this time I was so mad about forgetting the eggs, I doubled it. It’s hard to see in the picture, but I have a big mixer and I was unsure half the time it would all fit in! It’s a good thing I ended up doubling these because every single one sold at the bake sale. I’d say that’s a win. I got loads of compliments, too. I’m adding these to my favorite recipes. 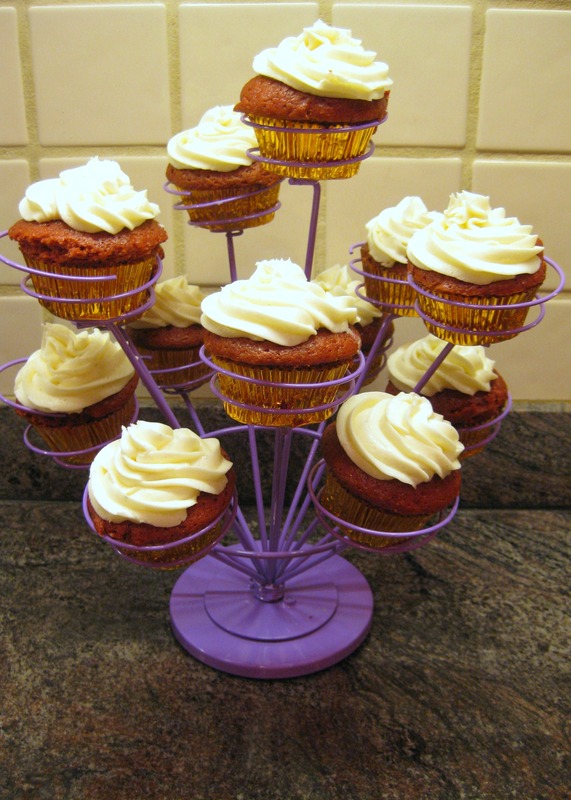 Red food coloring – preferably the no-taste kind, too much red makes the cake bitter. 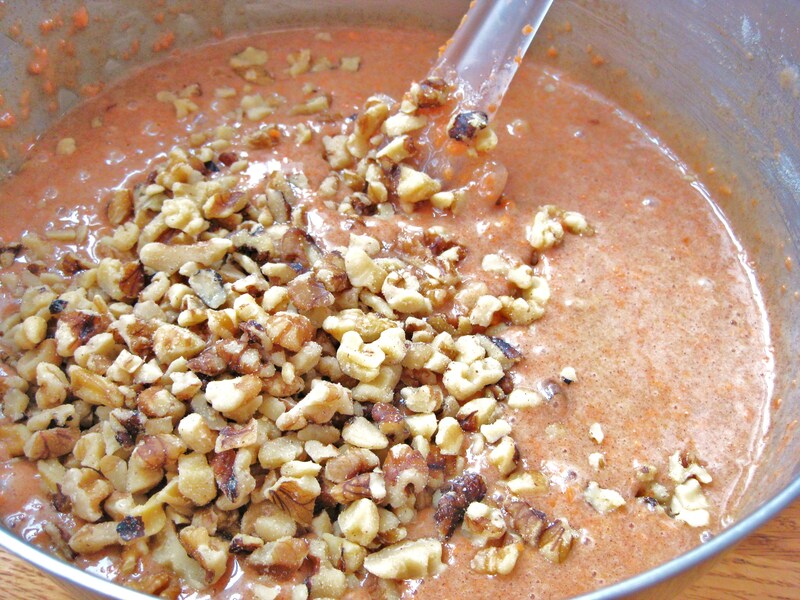 While on slow, mix the wet ingredients into the dry, don’t over-mix. So easy. Yet I forgot the eggs. How I could have done that, I still don’t know. This afternoon, since I am a professional treadmill breaker, I was forced to run in the freezing weather. And you know what? I loved it! No one was out and with all the snow it felt like I was running through a winter wonderland. Accompanied by my faithful ipod of a companion, it was great! Only problem? I’m starting to realize that every time I go out to jog I wear an unattractive outfit. Every single time. I don’t dress with the intention of making the neighbors laugh. With a closet like mine, and a fashion-sense like mine, it just happens. Did I mention my awesome talent for posing? I’m considering modeling as a future career. Not. Super exciting news! Tomorrow I’m helping Gale Gand, a famous pastry chef, with a cooking demo near us. I can’t wait. I’ll update soon!! Off to watch some more cupcake wars. A show I will never try to base cupcakes off ever again. Ever. Sunday night slipped into Monday morning while I re-wrote my English paper. Naturally this did not make me happy. Then again, neither did my first paper. Oh well, you have to do what you have to do. No worries, though. I mended my annoyance with highly caffineited black tea this morning. My tounge still has that frilly feeling after boiling water floods your tongue. I abruptant stops on the bus. Anyway, when the tea’s affect finally kicked in, my day significantly brightened. My classes went by fairly fast which was great. My morning no longer looked so dull. Fabulous. And I didn’t have to go to Skills for Success today. Perfect. Yup, I’m considering drinking tea every morning. 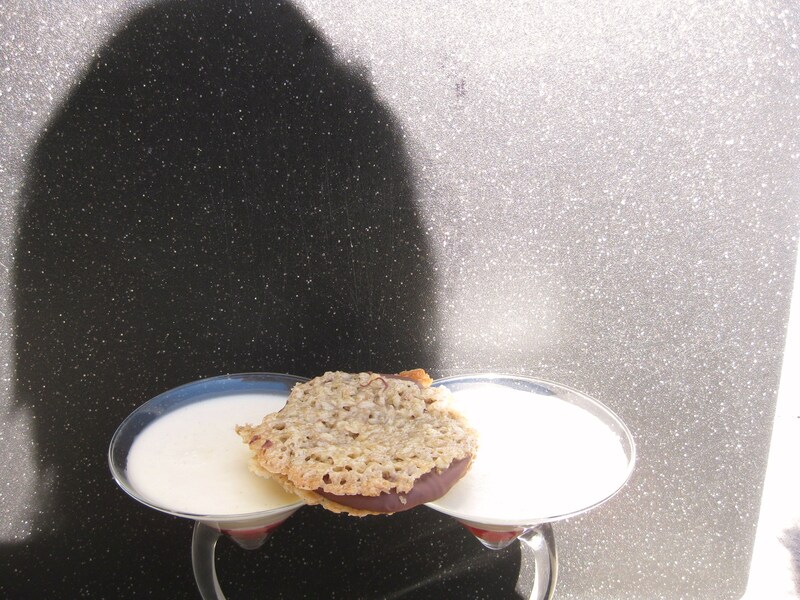 This afternoon I got home and decided to throw my healthy kick a little and make some cookies. In my defense these cookies had peanut butter and oats in them. So I’m pretty sure they were semi-healthy… on second though, you don’t need a defense if you’re not guilty. And OH MAN were these cookies good. The recipe is from The Food Network. 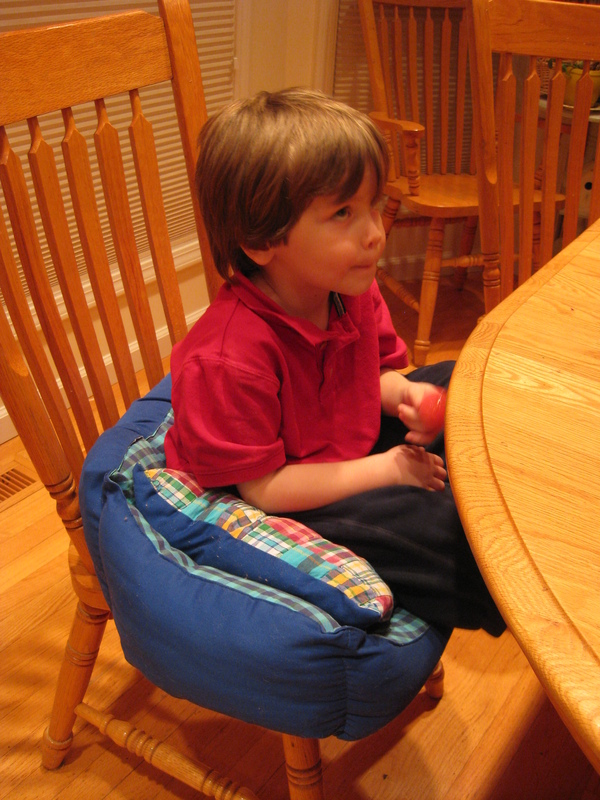 I made it with a few adaptions to what we have in my kitchen! 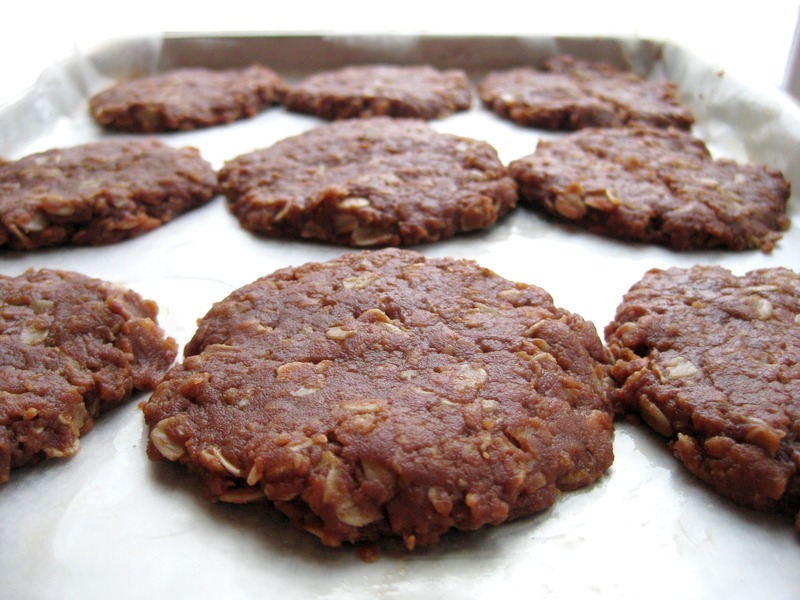 They’re no-bake chocolate peanut butter cookies. Delicious and the easiest cookies I’ve ever made. Don’t be fooled the unattractiveness of these cookies. They are AMAZING! 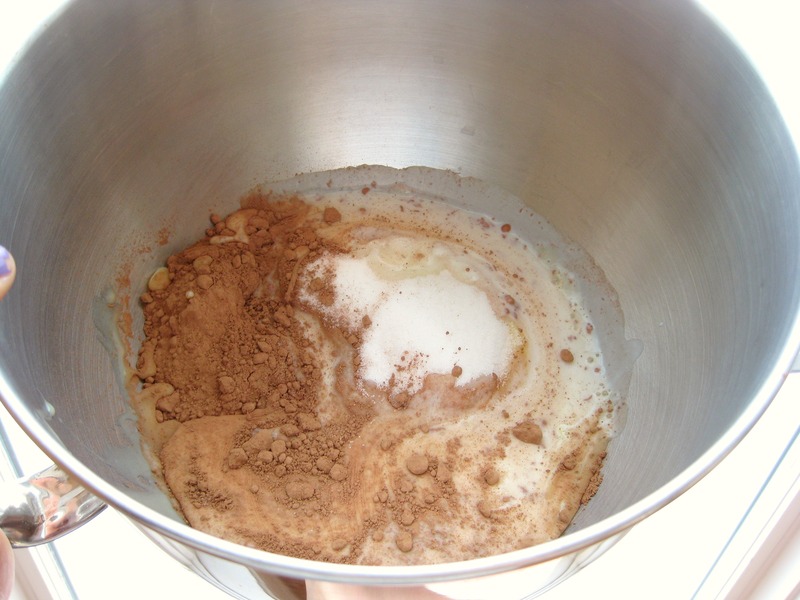 Combine 1 stick of butter, two cups of sugar, 4 tablespoons of cocoa, and 1/2 cup of skim milk together in a pan and bring to a boil at medium heat. Stir and allow to boil for one minute. 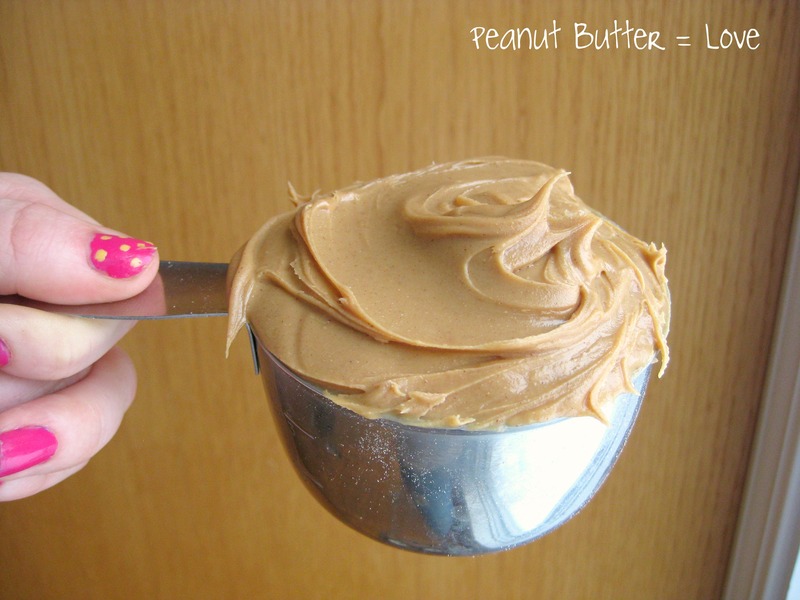 Reduce to low heat and add 1 cup of peanut butter. Stir until incorporated, turn heat off. 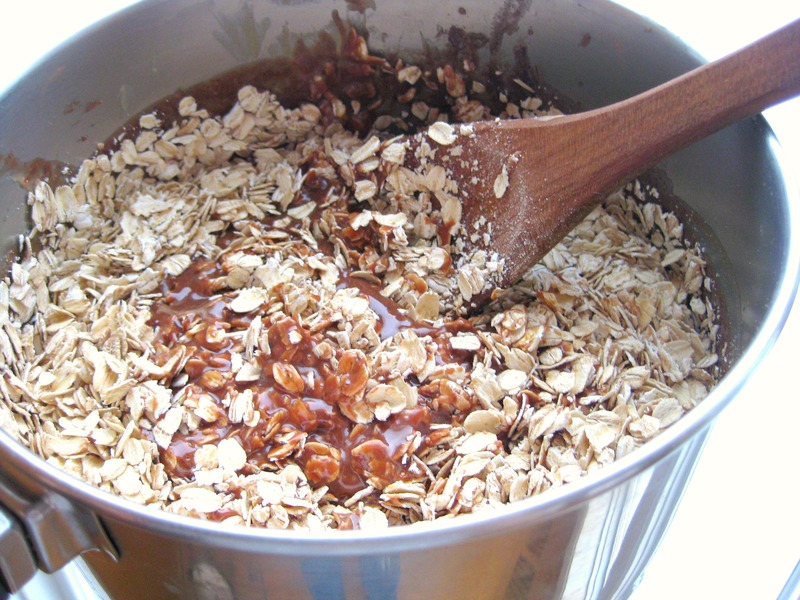 Add 1 teapsoon of vanilla, 3 cups of rolled oats, and 1 small single-serving sized oatmeal packet, stir and allow to cool down for a few minutes. *Don’t worry, let the dough cool a little and it will harden up! When it does and it doesn’t completely scorch your hands to touch, roll the dough into balls and then flatten them into a cookie shape on a piece of parchement or wax paper. And you’re done! No baking involved! The boys absolutely LOVE THESE! Ryan, probably the most critical of my three brothers, didn’t wait for me to ask for a rating, he said these are a 10. I knew it was true when he took three more and told me that he kept telling himself that he should stop… these babies are close to gone and I made them three hours ago! We work fast. Off to finish my homework so I can watch Pretty Little Liars!! What’s your favorite unattractive food to eat? Being sleep-deprived doesn’t effect me like it does most people. You’d think I’d be majorly cranky. Not want to talk. Or be plain out tired. I can only wish these were the symptoms. They’re not. When I don’t get enough sleep I turn into a major snack-er, unhealthy things become especially appealing. When I’m tired, I eat. Who knows? Yesterday I slept over at my friend Claire’s. This is a gal who can stay up until 3am and sleep until 11 and be totally fine the next day. Me? I’m lame. Bed time is almost always 10. Last night, though, we watched The Last Song until 2:30 in the morning. I still don’t know if I was crying about how sad the movie was or about the attractiveness of the guy that played Will who was shirtless more than half the time. Either way I’m pretty sure it was the best movie ever. The movie inspired me. Who would have thought? A movie with Miley Cirus, inspiring? I’ve decided that I wanted to be buff. Seriously. But apparently invisioning yourself as buff doesn’t make you buff. You actually have to lift weights. We don’t have weights in my house- we have cookies and fudge- It was definately one of the shortest lived dreams I’ve ever had. I ended up getting over it, had some fudge, and played in the snow with Nicky. That’s exercise, right? 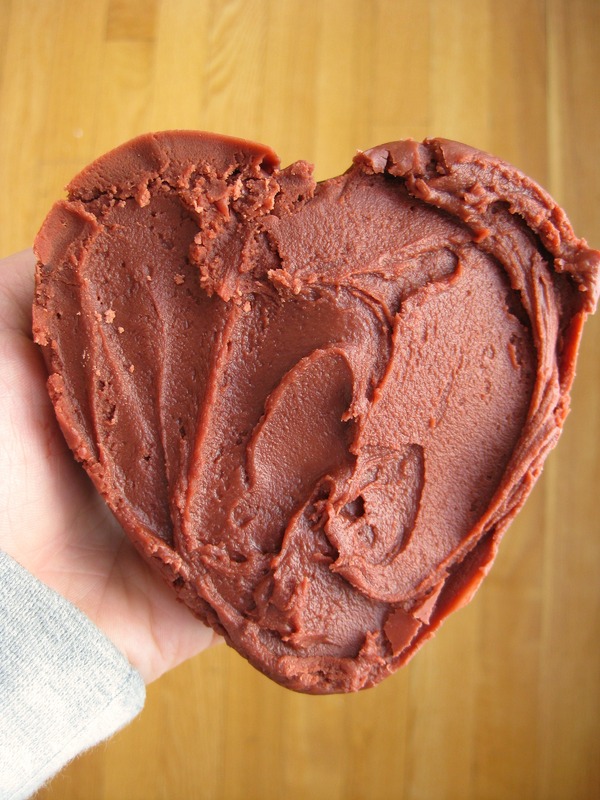 Boredome + an upcoming holiday with red + buttermilk that was living on its last leg in our fridge = Red Velvet Fudge. Who would have thought?! It was actually delicious and it’s been one of my many sleep-deprived snacks of the day! 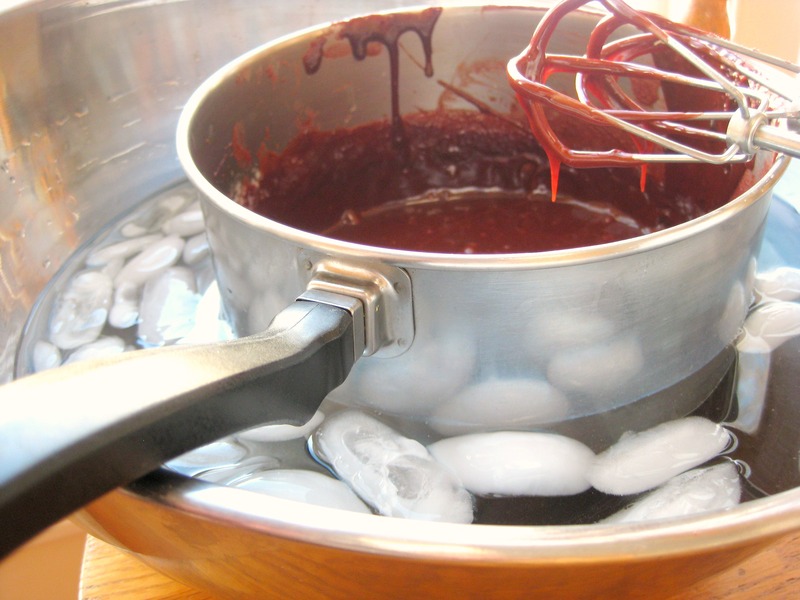 Our thermometer didn’t work so I just eyed the fudge and guesstimated when to take it off the stove – check out the recipe and exact instructions that include thermometer temps at i am baker. 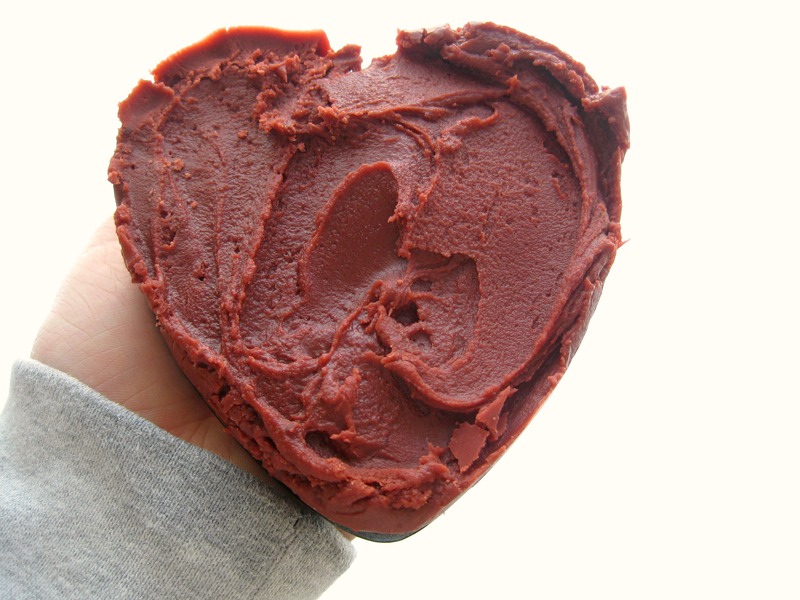 Overall the fudge was delcious, smooth, creamy, and not grainy at all! My family devoured it! 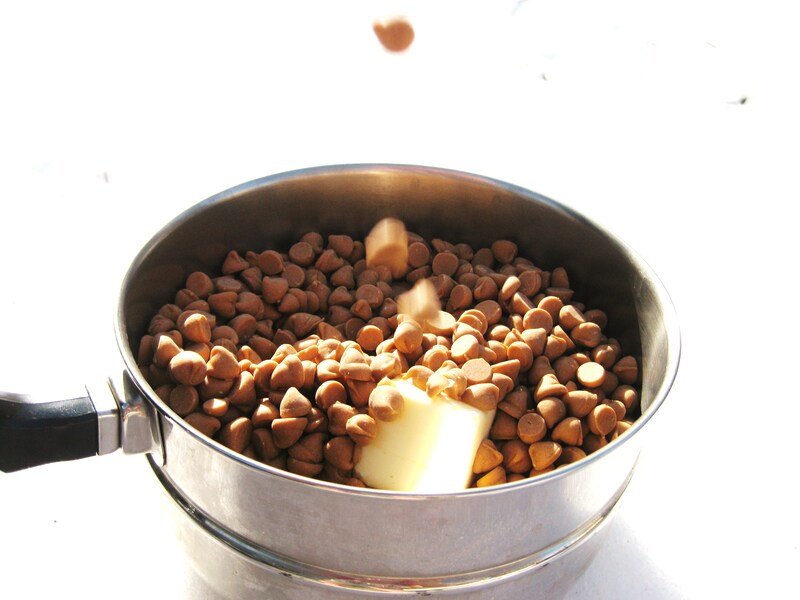 Throw the ingredient into a pot on medium heart only to find out that your theremometer doesn’t work. 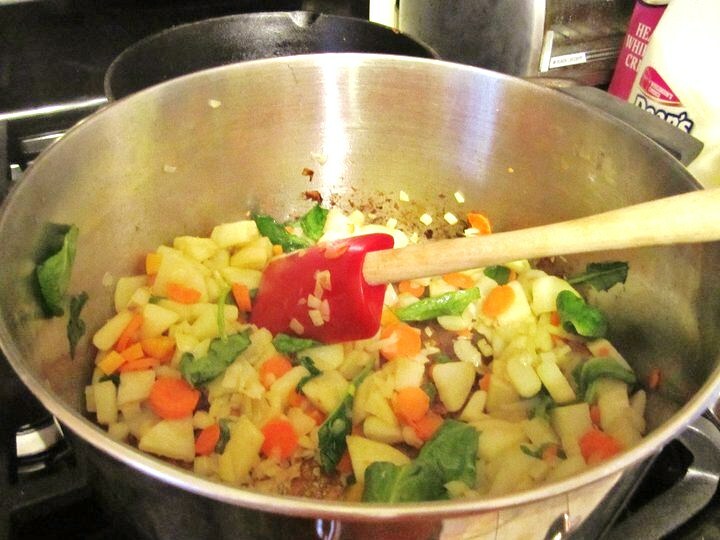 Stir constantly until it boils for two minutes, reduce heat to low and allow it to simmer for about 5-7 minutes. DO NOT STIR WHILE ITS SIMMERING. Seriously. 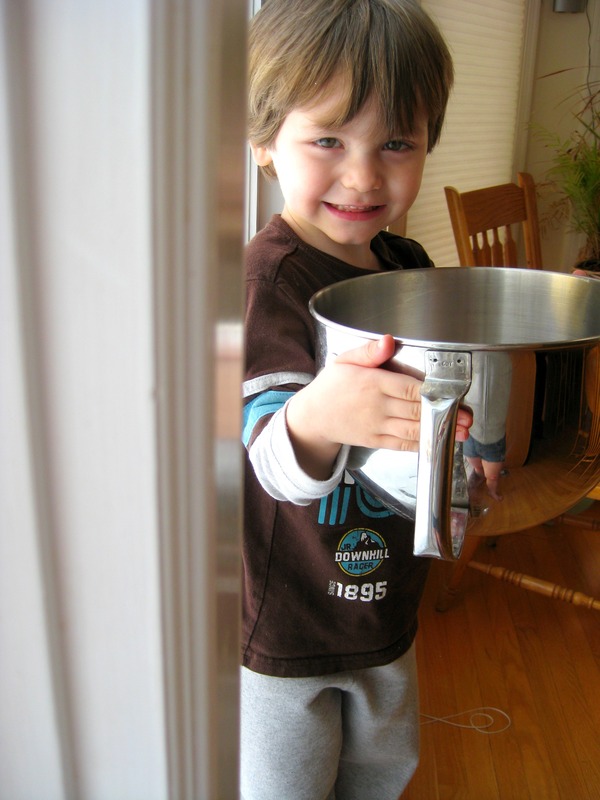 Grab a big bowl – if you don’t have one that’s big enough use the sink- and fill it with water and ice cubes. 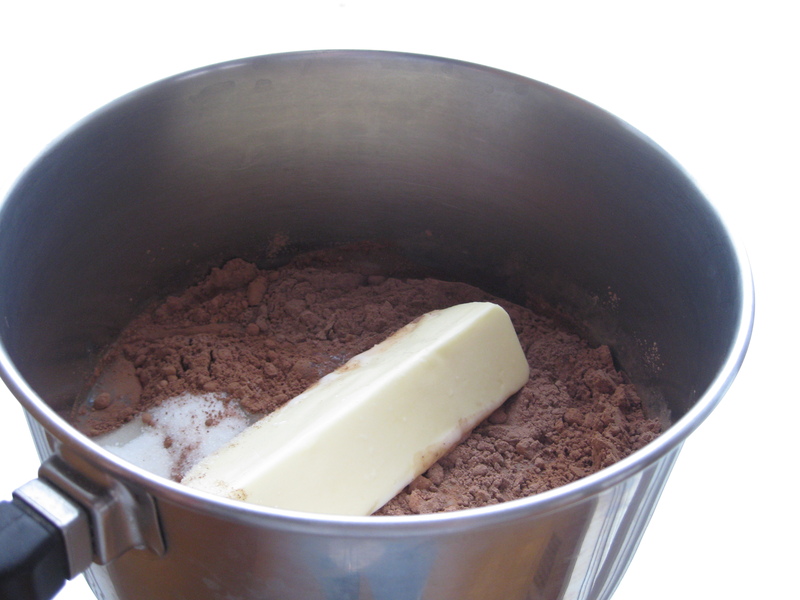 Put the pan into the cold water and mix until the fudge becomes thick. Now just pour into whatever container you like. 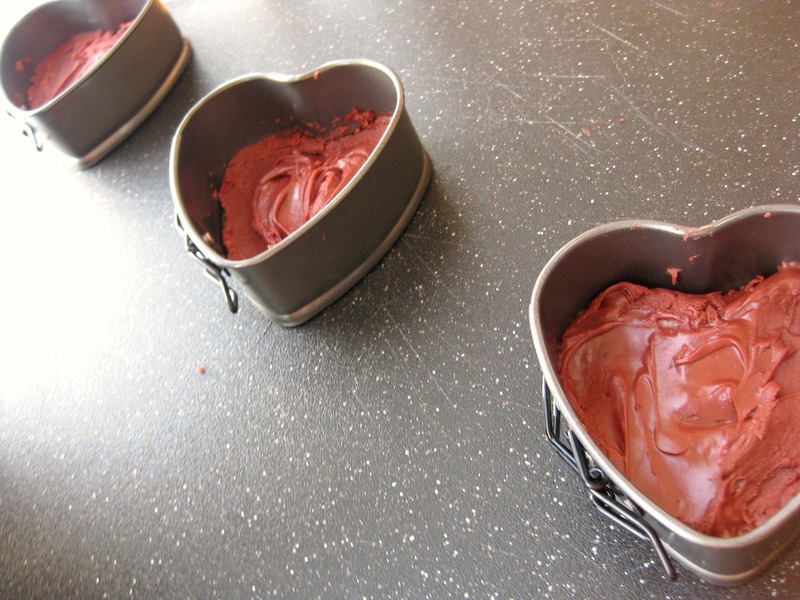 Nick and I went through all my cake pans and he liked the big hearts the best. So the big hearts it was. I want to know, leave a comment telling what your favorite valentines day treat is!? Two snow days later, today is Friday, an actual school day. Disappointing, I know. The break was aboslutely amazing, though. Day 1: I partied it up in my house with some youtube playlists with Shania Twain and Pink after growing tired of repeatedly hearing on the radio that I shouldn’t drive in the weather because it was a blizzard. Thanks for the update, guys. While my brothers played videogames, I made sugar cookies for the bakesale that my newspaper class was having thursday. It was all great and dandy until I realized there were no pipping bags in my house. I ended the day with a run on the treadmill where I proceeded to stomp out my frusteration for the lack of piping bags. 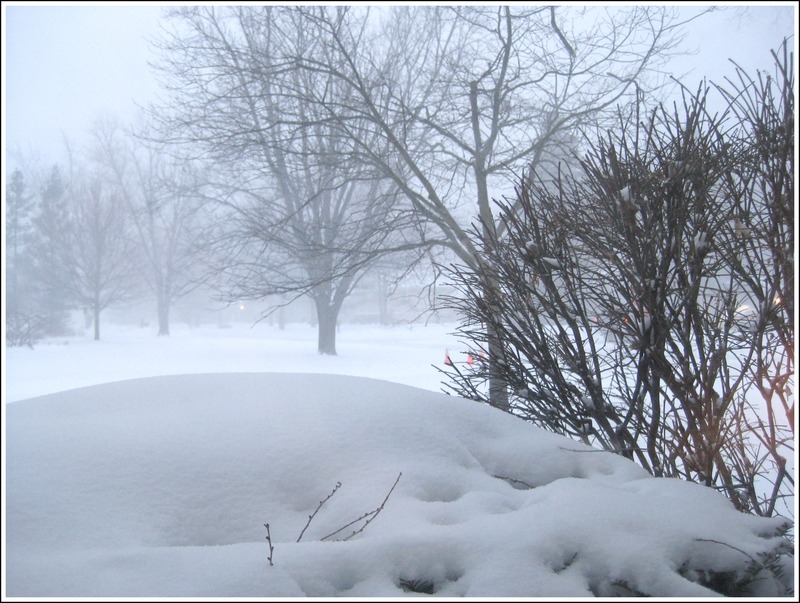 Day 2: Turns out there was no school Thursday, either. My mom and I ended up going out to run errands. 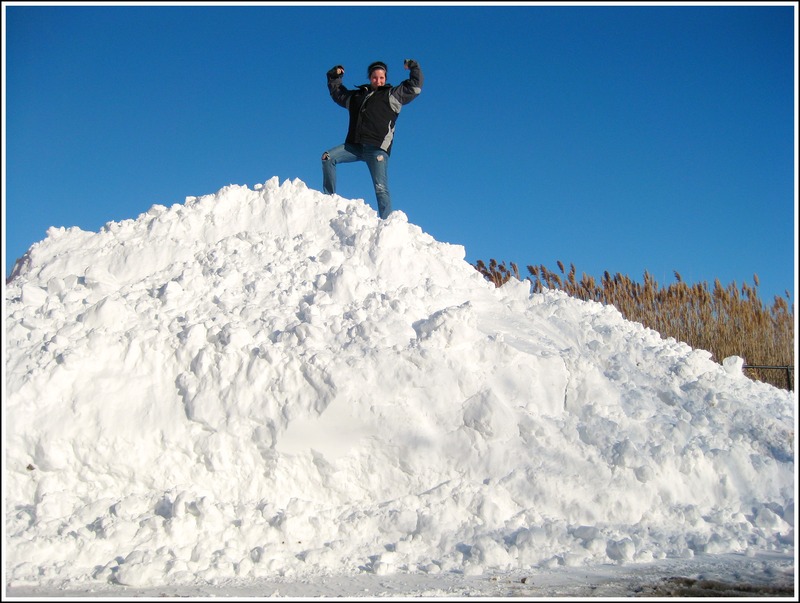 I hadn’t been out in the snow yet, but man was it piled! 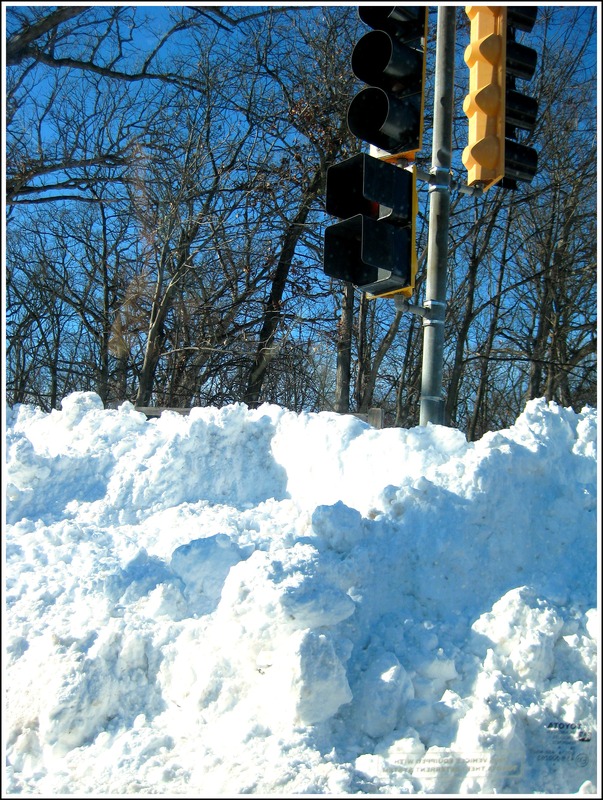 We had to make a few stops before Joans, one of which included a stop at a snowbank. Why yes, I have been working out. 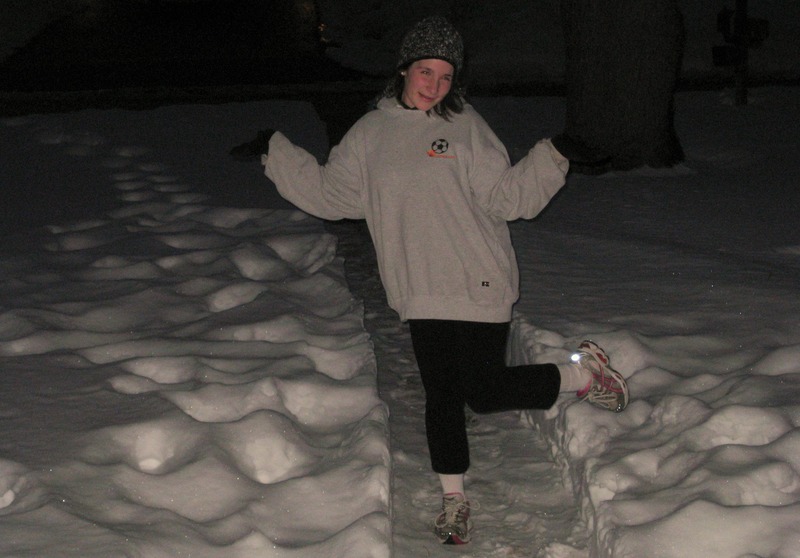 Can you tell my big muscle-y muscles and by the way I moved that snowbank under my feet? I owe it all to the spinach in the smoothie I had the other day. On the way home we were stuck in some major traffic. I guess it happens when major roads are cut down to one lane, though. Mom’s never too pleased when she’s the one who gets stuck driving in the traffic. So while she was slowly easing forward every two minutes, I read fifty pages in Jodi Picoult’s book, Keeping Faith. Then I remembered my camera, and couldn’t help but showing off my new toy from TJ Max. When we finally got home I scrambled to finish my creative writing piece for lit. I was sort of crossing my fingers for a snowday today. No such luck. Today was a really slow day. There was nothing due except the paper that I’d finished and printed last night. So today basically all I had to do was show up for school. None of the teachers seemed too enthused to be there, either. 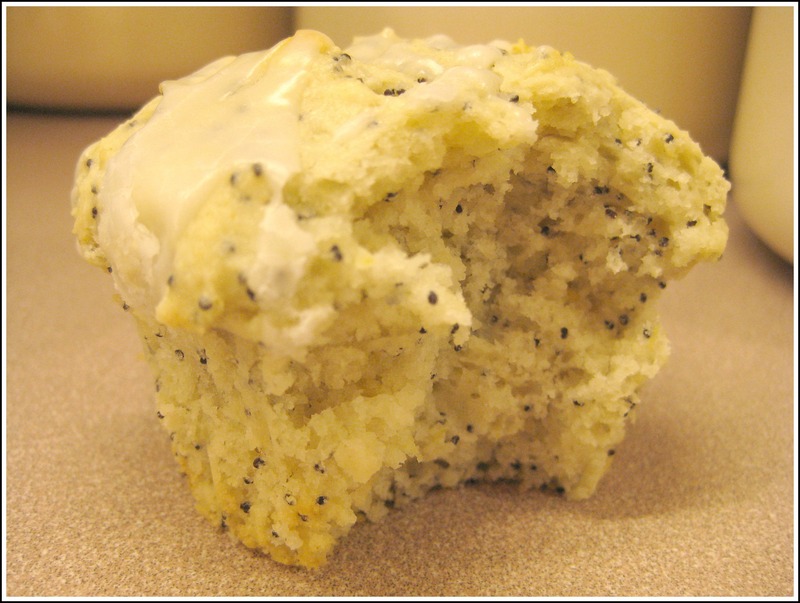 Tonight all I wanted was a Lemon Poppy Seed muffin. 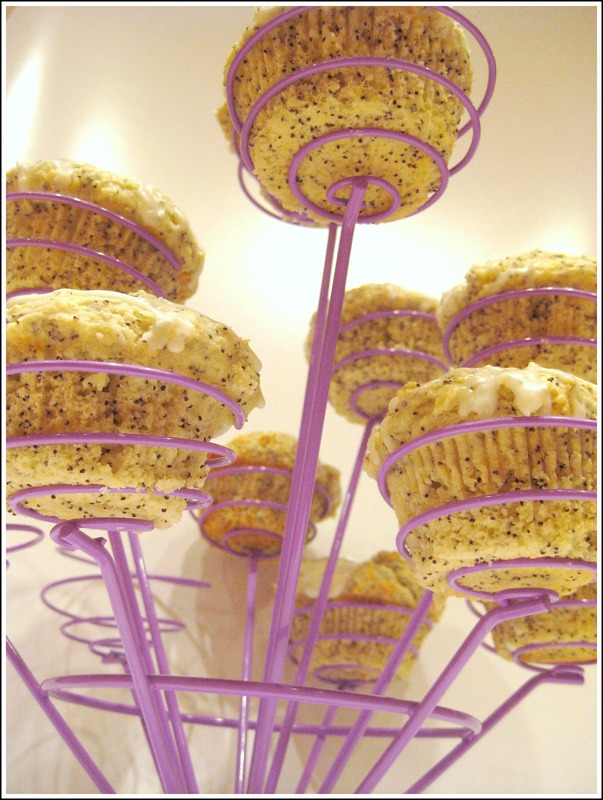 Was it so much to ask for my mom to stop working early so that she could make me Lemon Poppy Seed muffins? 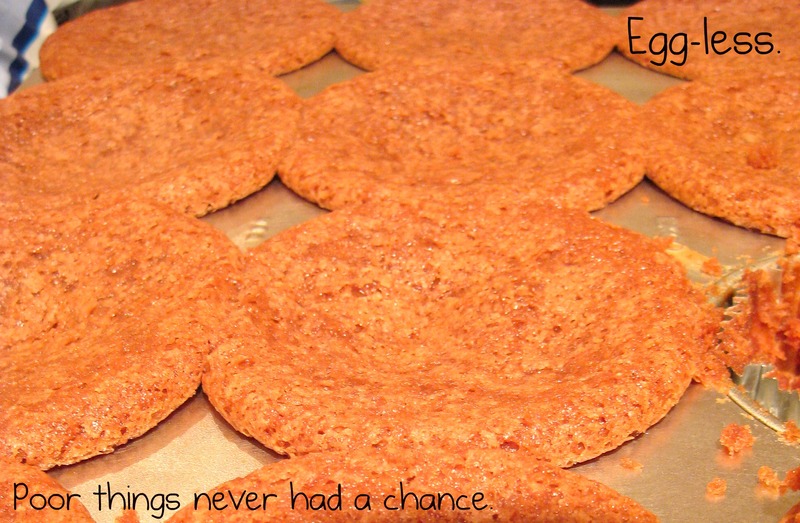 I guess so, because I decided against being lazy ended up making them. 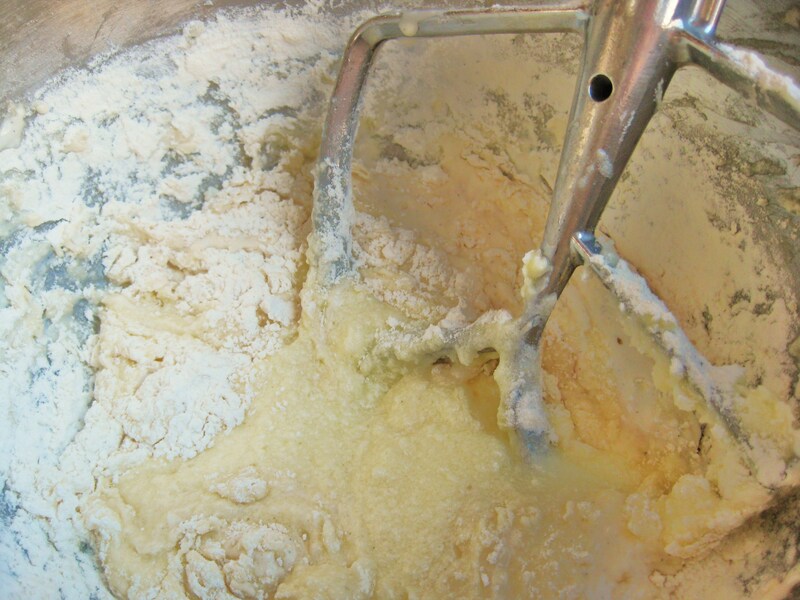 The batter is literally addictive. It’s so light and fluffy even before you put it in the oven. I’ve been wanting to make something from Christina‘s blog for such a long time and I’m so glad I finally got to tonight! 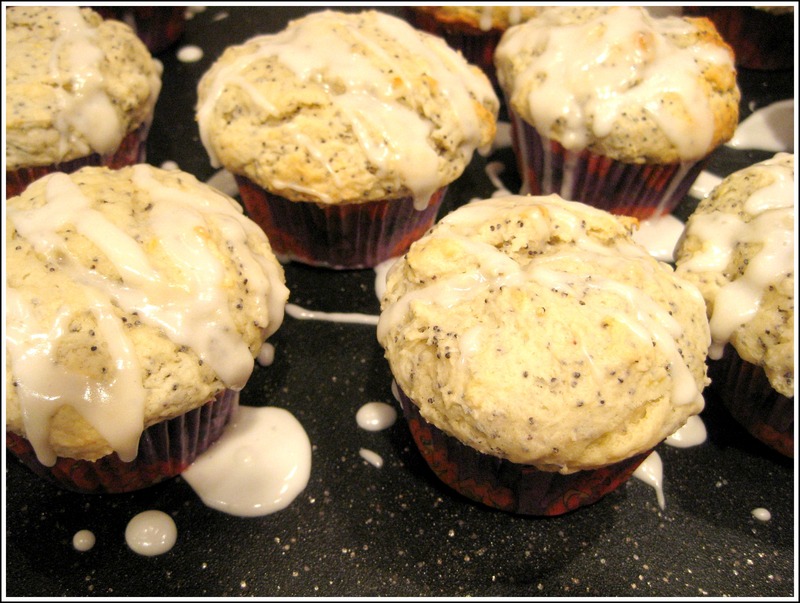 These muffins will definately be saved into my favorites, they’re light but still have a nice denser consistancy, and the topping is like sweet-lemon-y goodness! 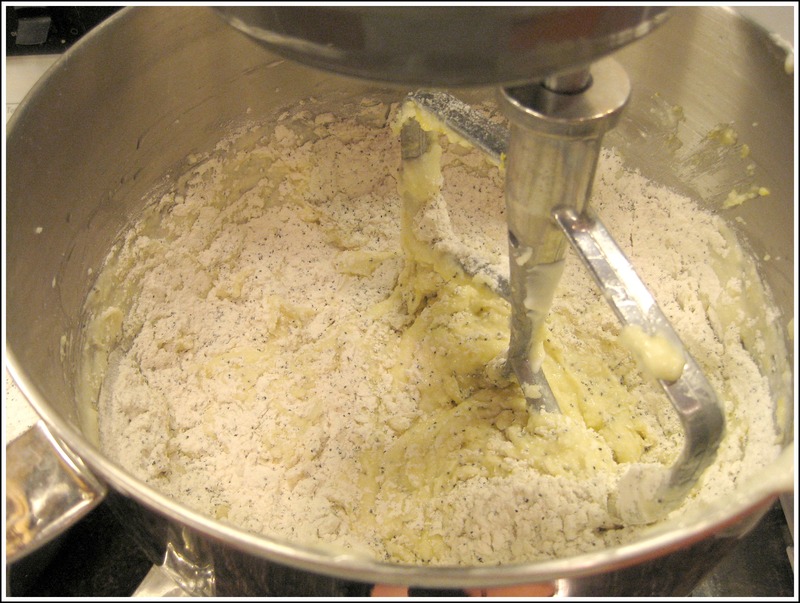 Combine the dry ingredients and poppy seeds all together, excluding confectioner’s sugar. 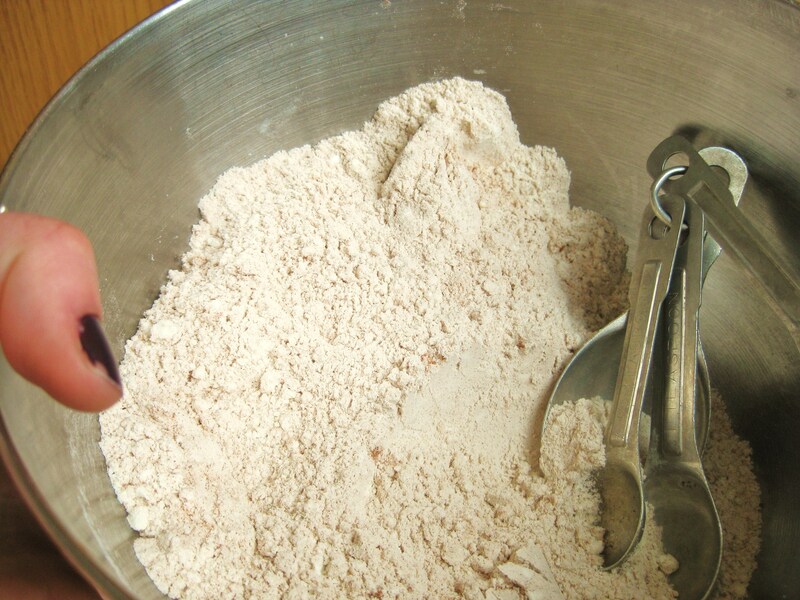 Mix the dry ingredients into the liquid very slowly, and DO NOT OVERBEAT OR YOU WILL RUIN THE TEXTURE! 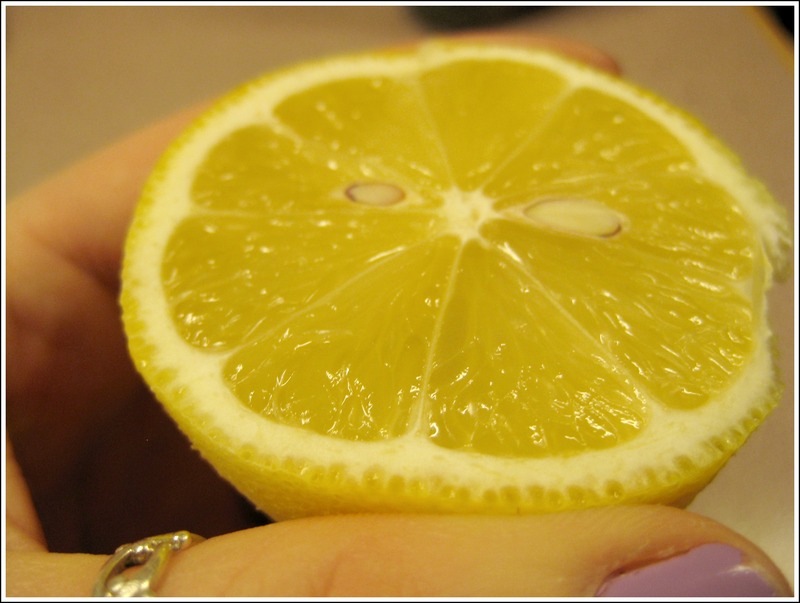 Combine the 2 1/2 tablespoons of fresh lemon juice with the confectioner’s sugar, drizzle over and enjoy! !